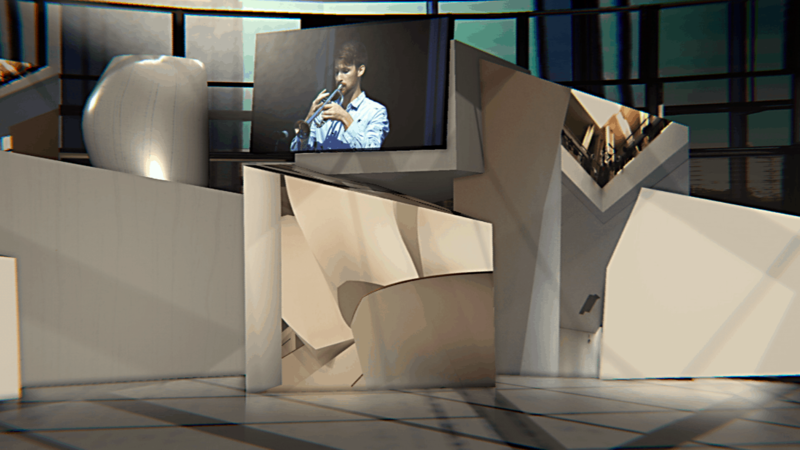 Created to open the annual Digifest event in Birmingham on 12th March 2019. 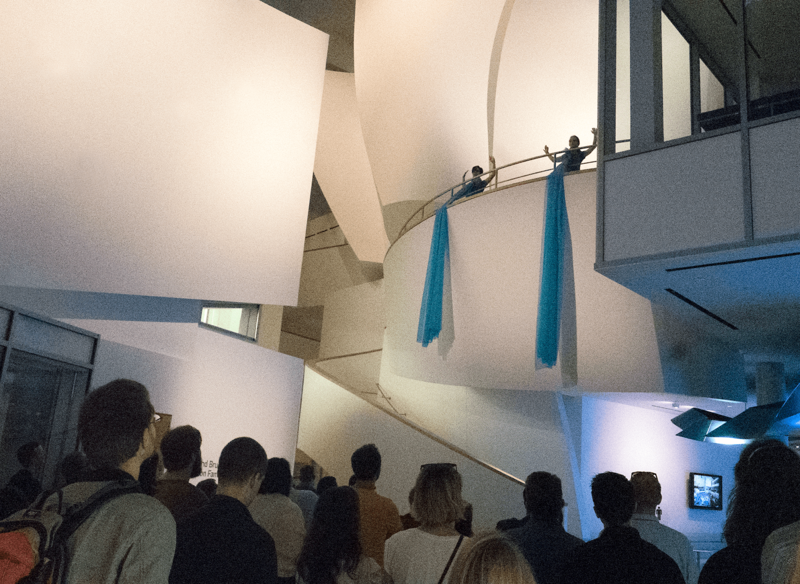 A live performance between the Museum of Contemporary Art (MACBA) in Barcelona and Hall 1 of the International Convention Centre in Birmingham, England. 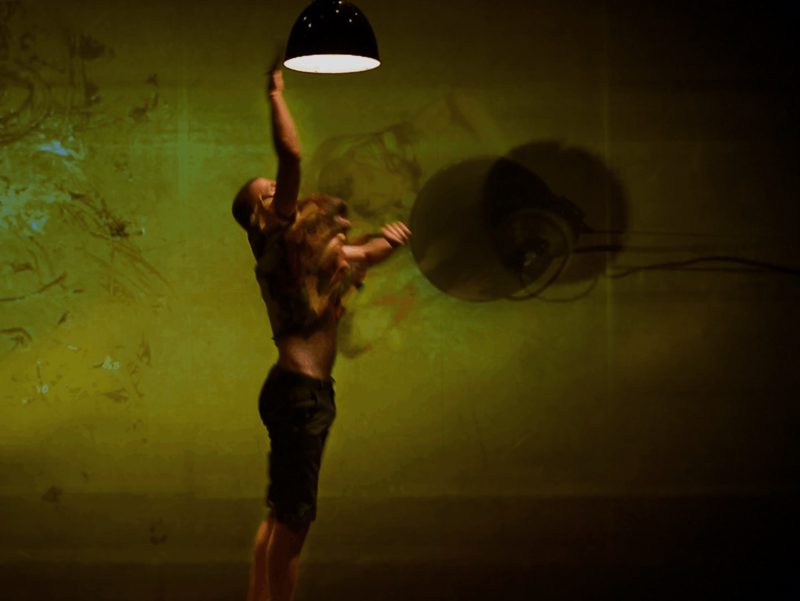 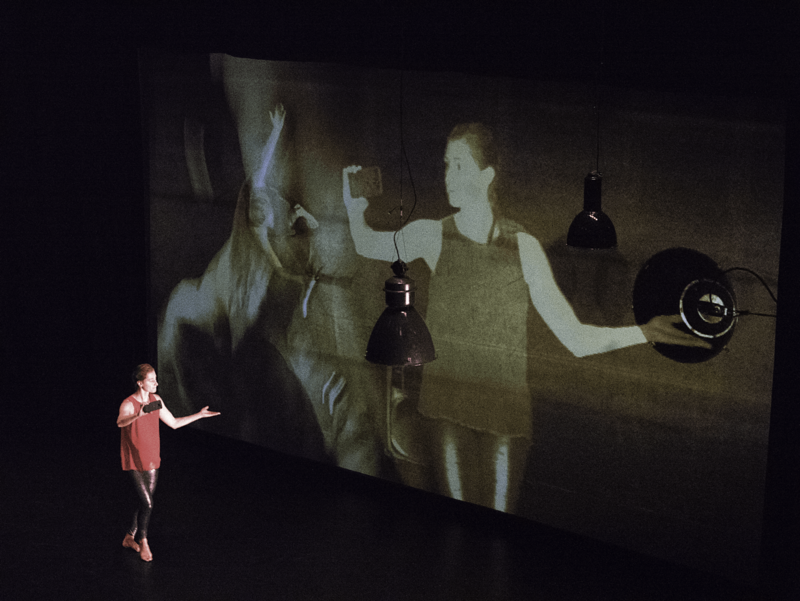 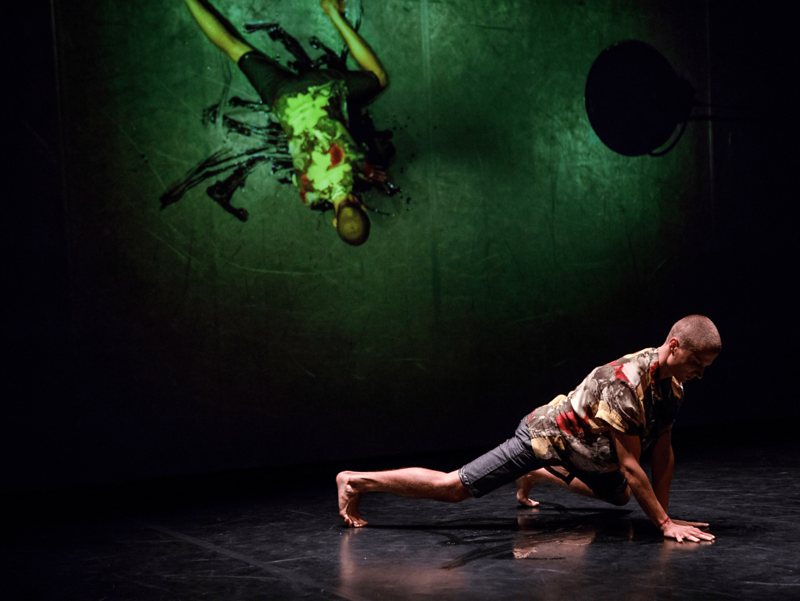 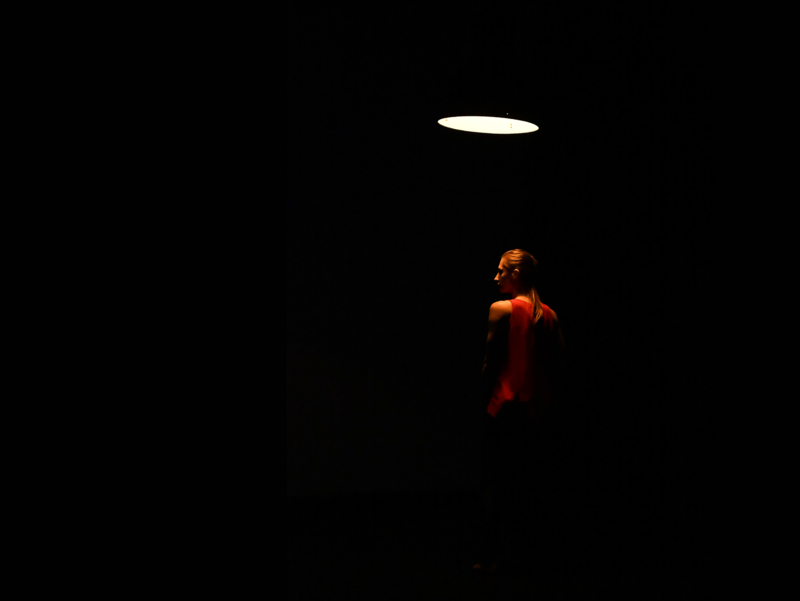 Two cities, two performers, two audiences, one stage: Opravdoví, an investigation of parallel realities in the multiverse. 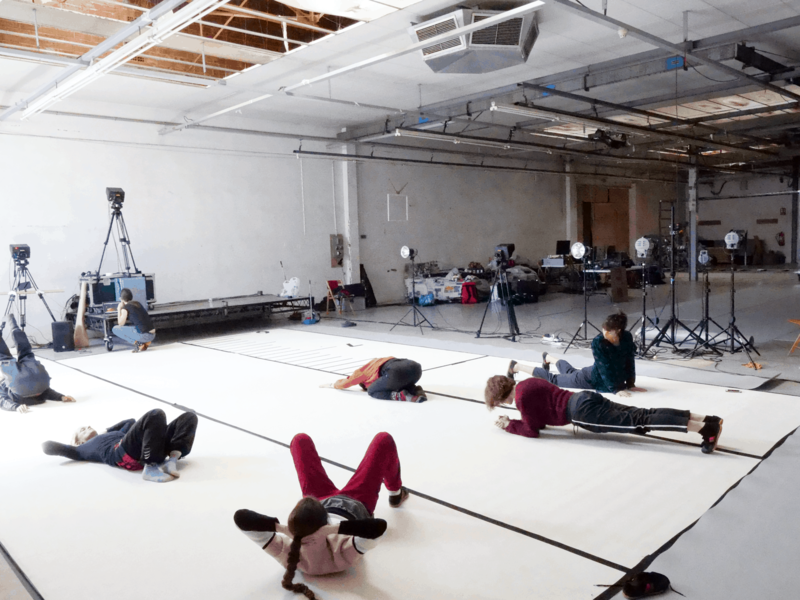 A networked performance, which through the concurrent movement of solo performers in two locations, explores what it is to be the “real ones”. 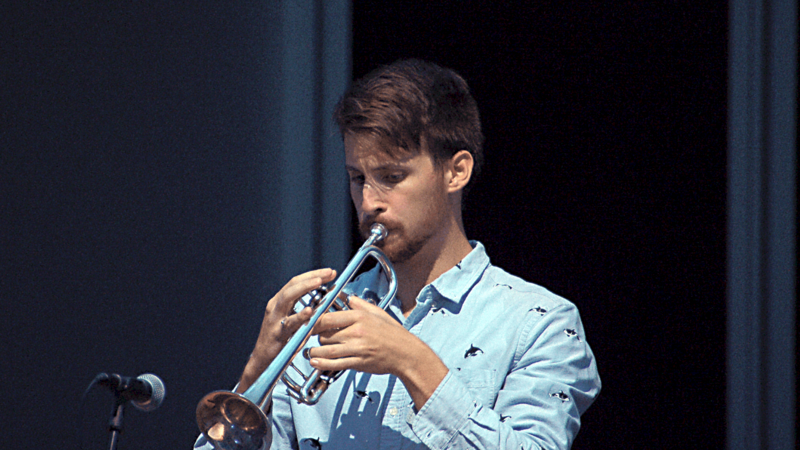 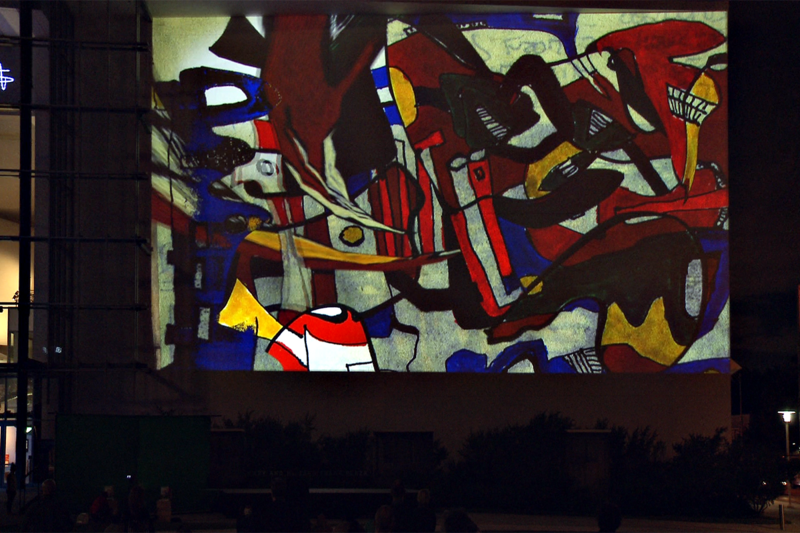 Opravdoví premiered simultaneously in UFFO, Trutnov and Moving Station, Pilsen on 26th September 2018. 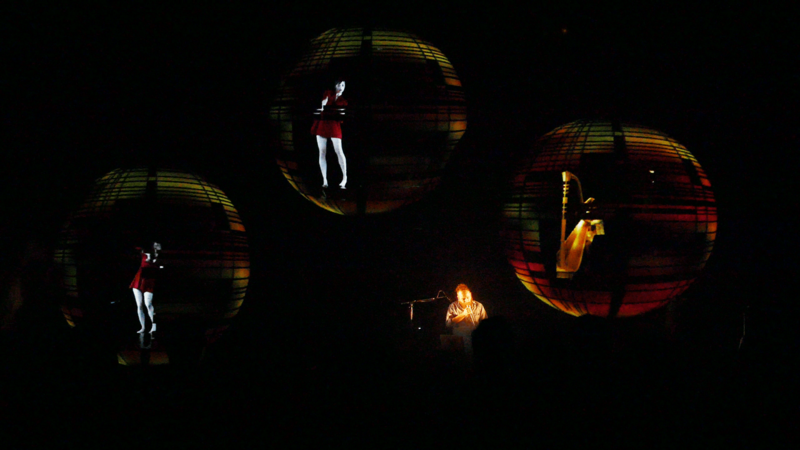 Uniquely, all technical aspects (video capture, mixing, streaming , mapping, audio and lighting across both venues) of the performance were centrally controlled and synchronised to a few thousandths of a second even though they were 250 km apart. 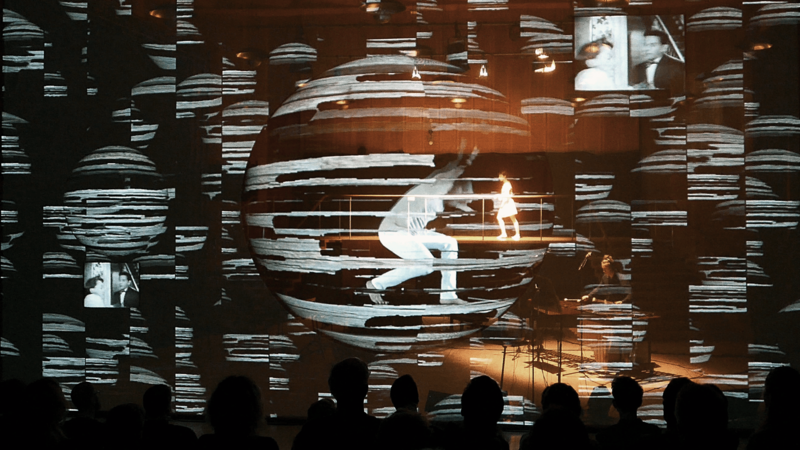 Longing for the Impossible for the Moment it is Real (Longing…), hosted by the Royal Danish Academy of Music in Copenhagen – Denmark’s first public networked performance. 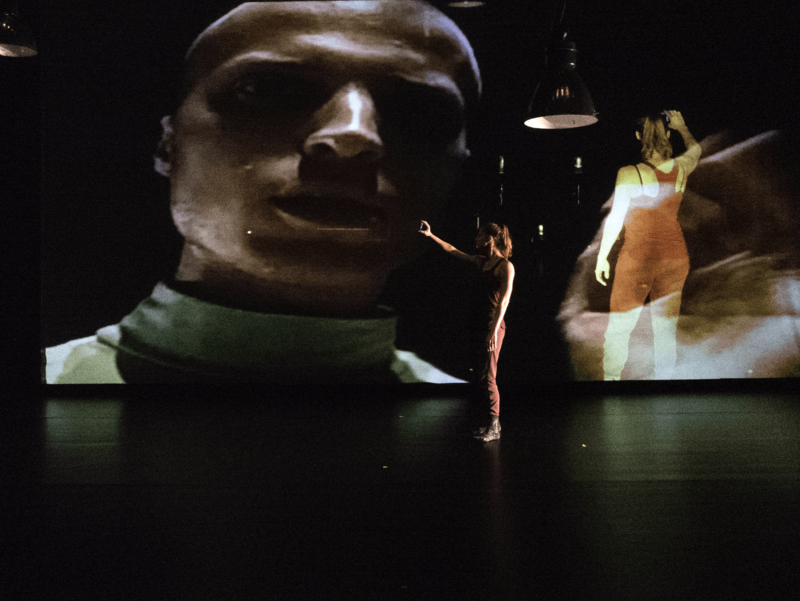 Longing… comprised 5 contemporary compositions which featured a different mix of musicians and dancers in Copenhagen, Barcelona and London. 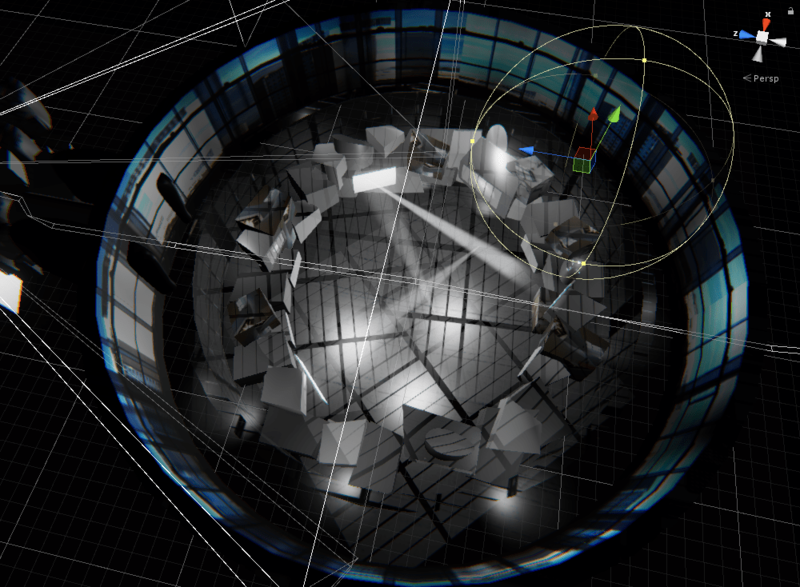 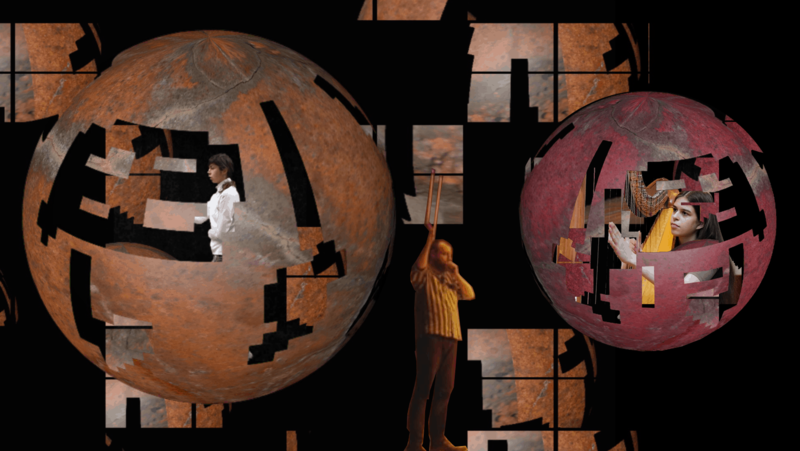 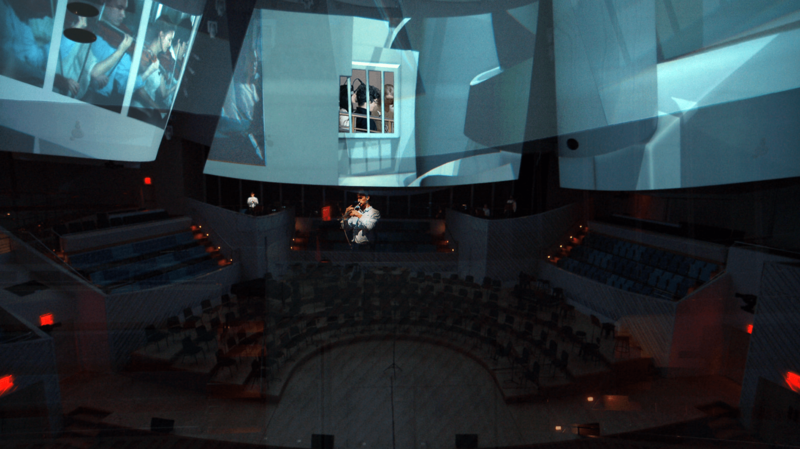 A visual theme of orbiting spheres (inspired by the atomic model of Danish physicist Niels Bohr) was used to create a networked performance dramaturgy in which the performers – regardless of physical location – were all elements of the same performance space as experienced by the audience. 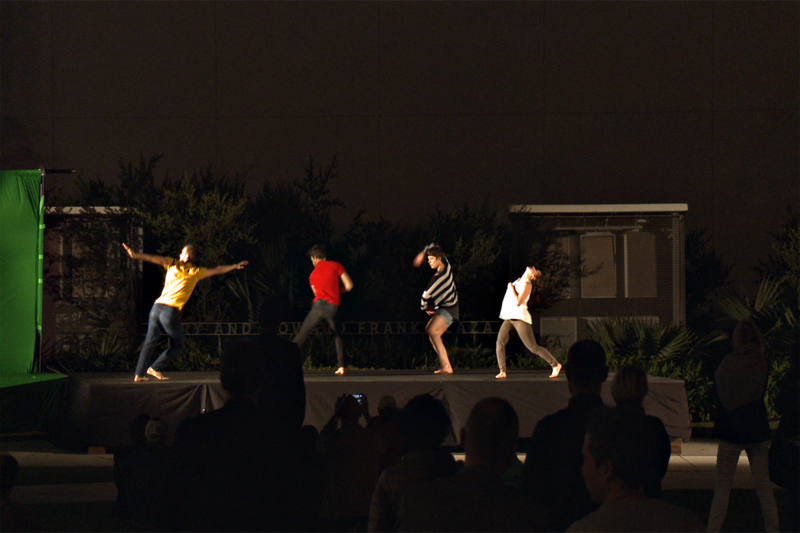 Animal #1 – composition by Esben Nordborg Møller for string quartet accompanied by 3 dancers in Barcelona. 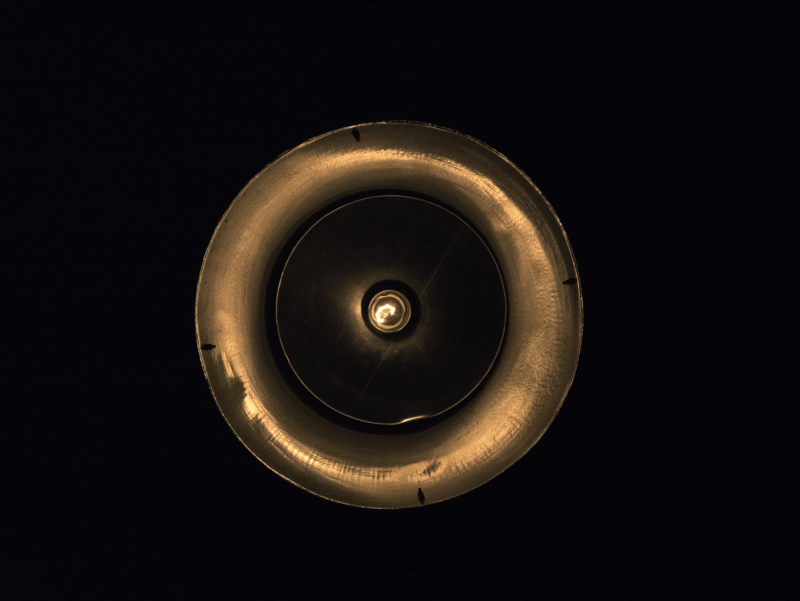 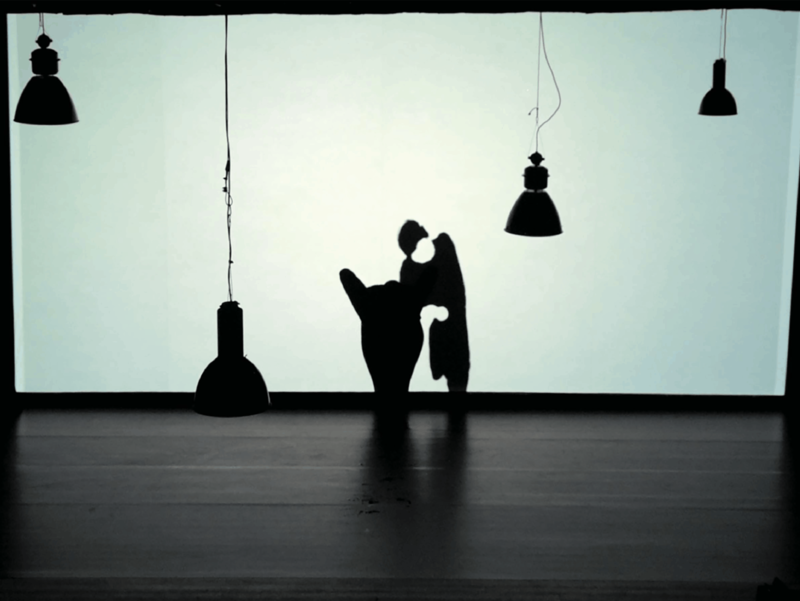 Perfunctory – composition by Rob Durnin for string quartet and marimba, two vocalist (one in Copenhagen and one in London) and a solo dancer in Copenhagen. 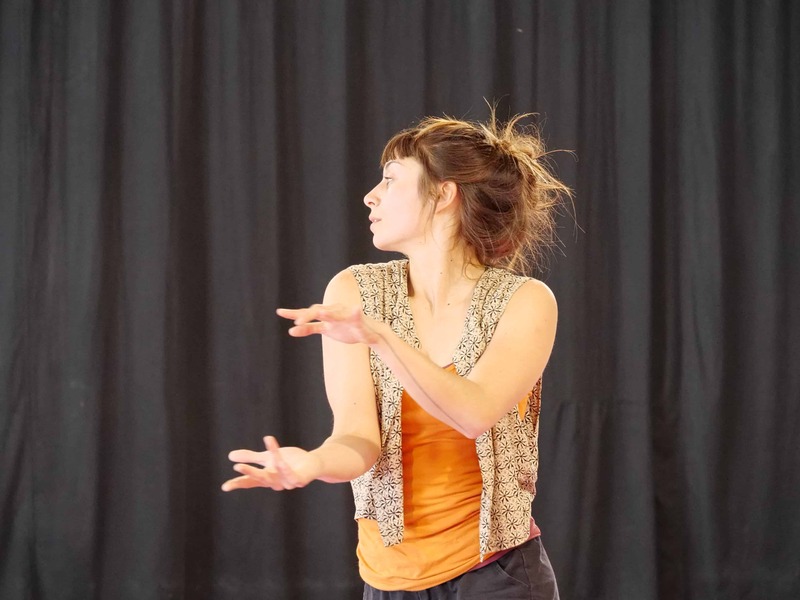 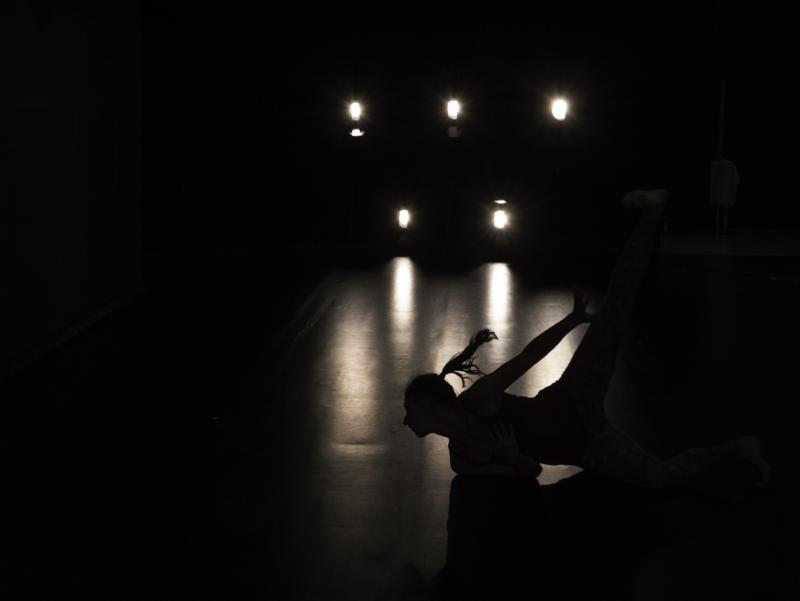 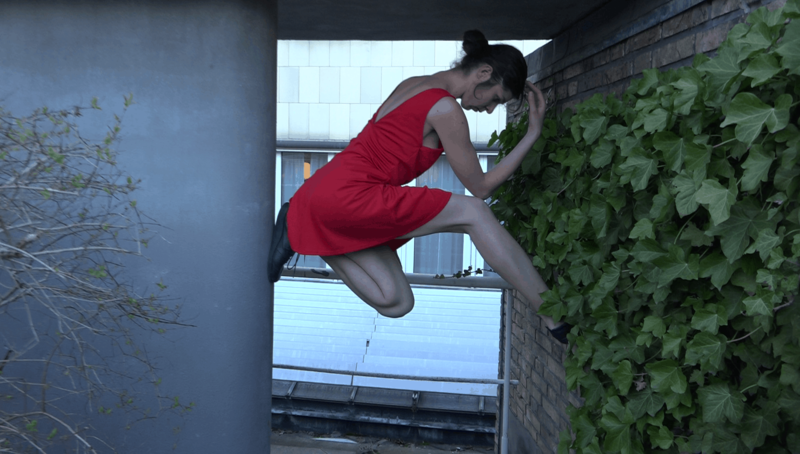 Invisible Movement – composition by Anna Nikolova performed by Anna on Disklavier with dancers in Copenhagen. 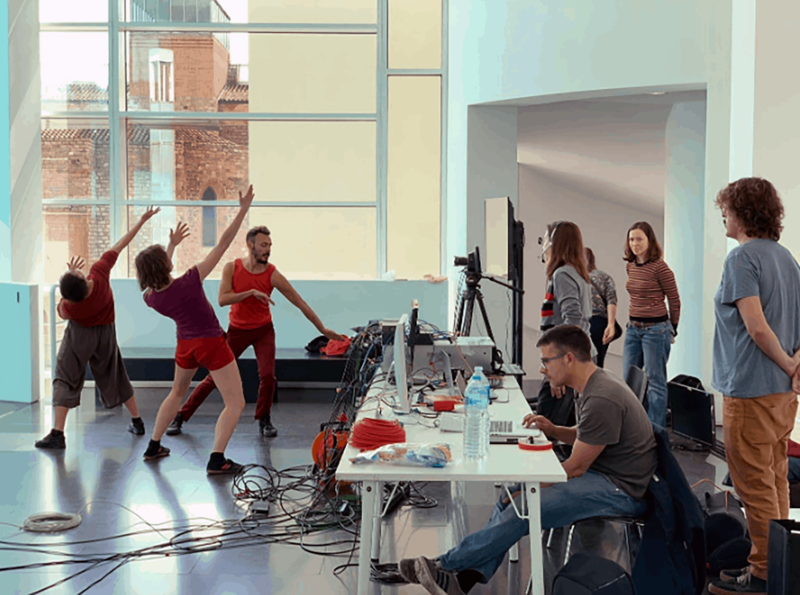 Your clone continues to run for his life – composition by James Black for Carophone (a custom instrument) performed by James, a Harpist dueting in London, and two dancers in Barcelona. 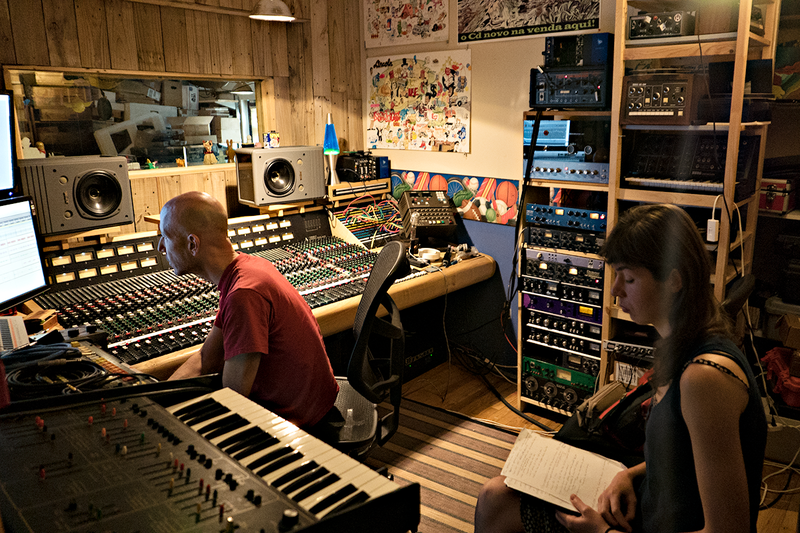 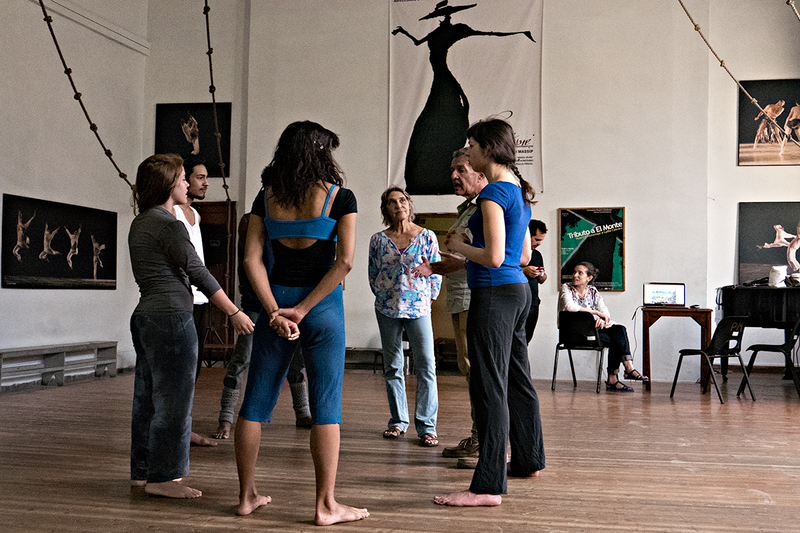 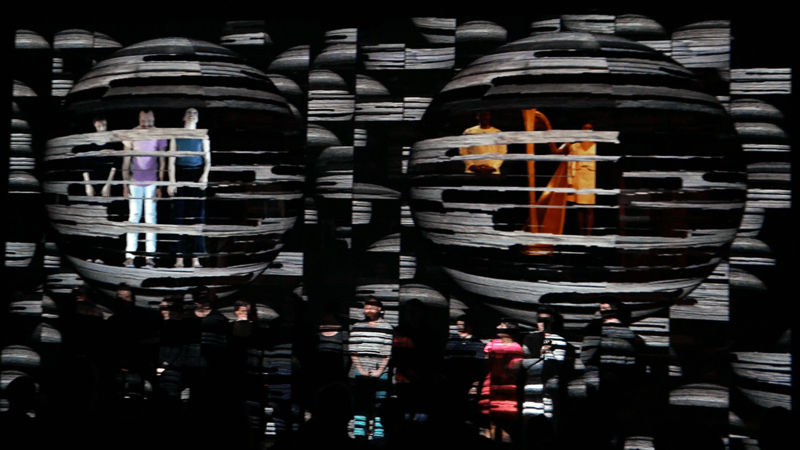 The Taking After The Kiss – composition by Xavier Bonfil for Marimba and electronics with dancers in Copenhagen and Barcelona. 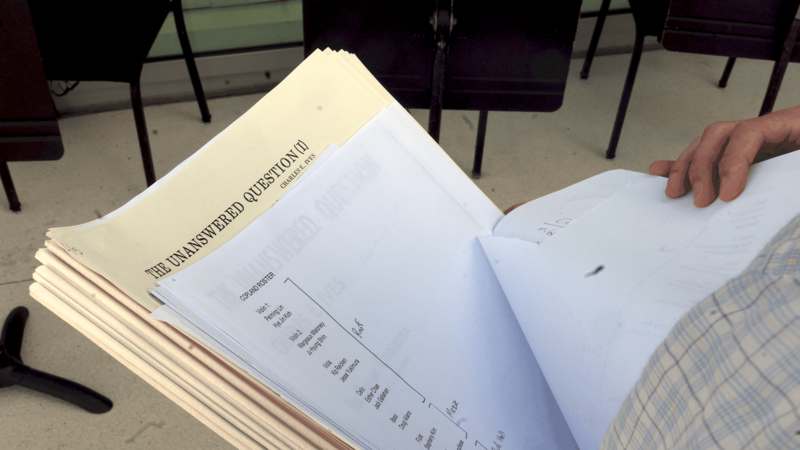 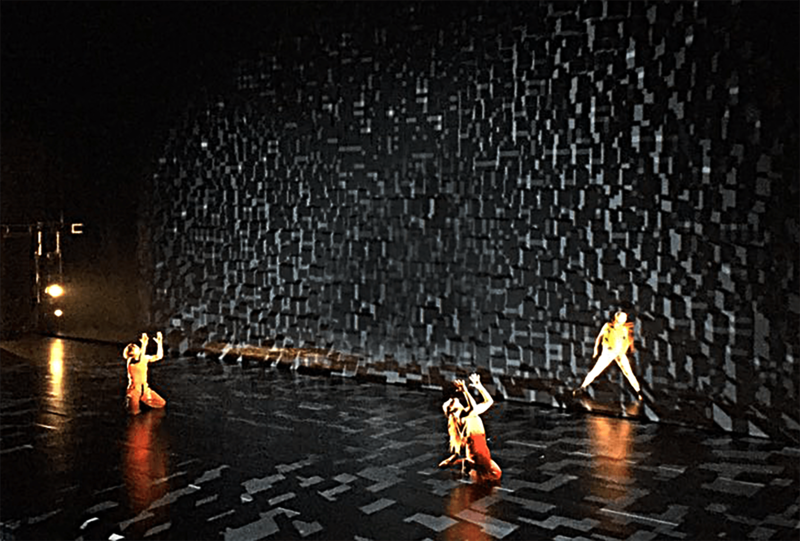 Longing… was performed for two nights at the Pulsar festival of contemporary music in March 2017 and again for one night at the Network Performing Arts Production Workshop in April 2017. VIDEOS: Difficulties with the cameras being used to document the performance and challenging light conditions means we are still working to bring you a more complete film of the performance but here are two short clips which show the beginning of the opening sequence (movement #1) and part of the closing sequence (movement #5). 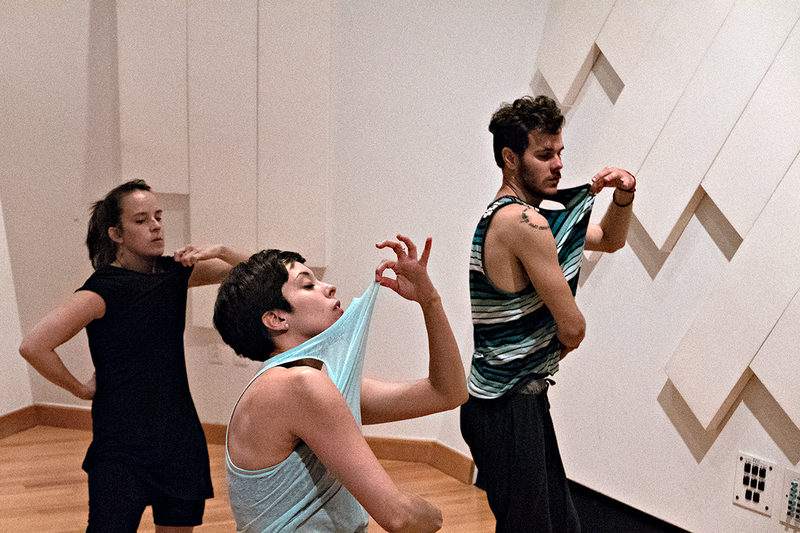 Supported by: MACBA, Barcelona; Institut del Teatre, Barcelona; Institut de Cultura de l’Ajuntament de Barcelona; CSUC, Barcelona; Royal College of Music, London; Studio Biscoe, UK; DeiC, Denmark. 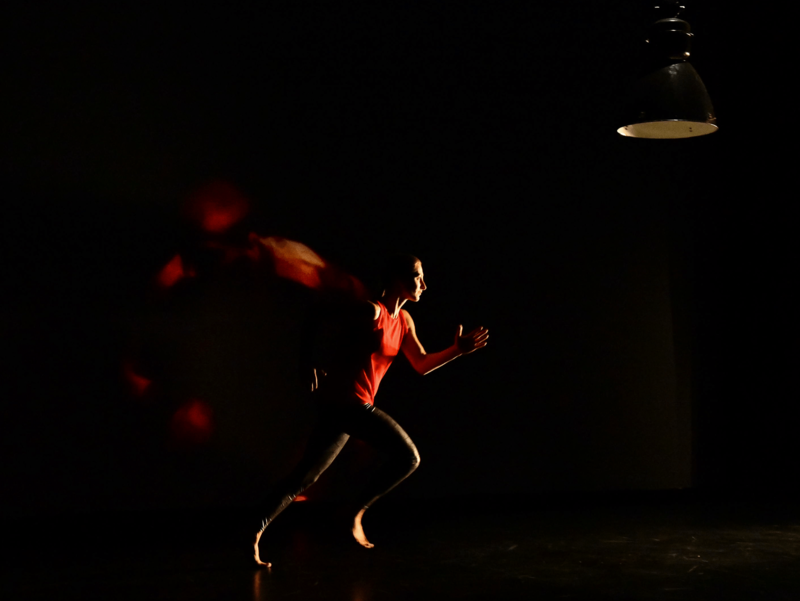 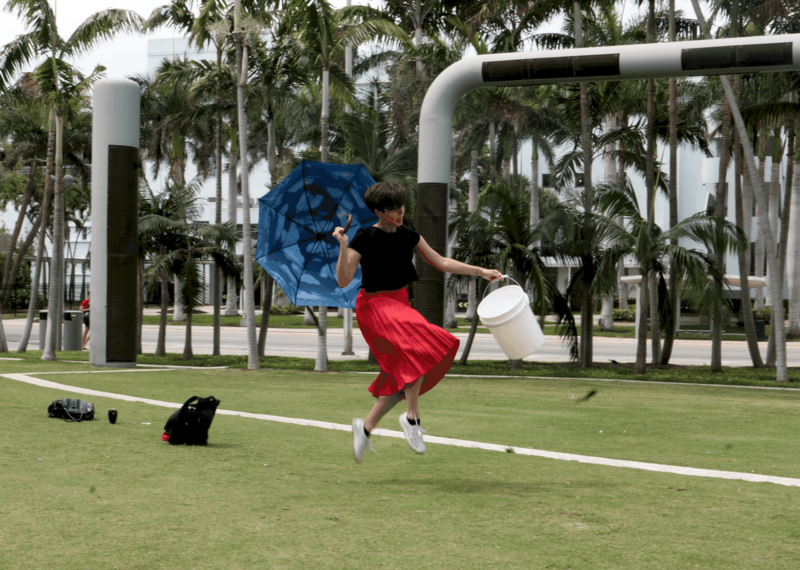 In association with choreographer and dancer Jana Bitterova (Movement Touch) a 4 location performance of dance and music between Copenhagen (DKDM – Royal Danish Academy of Music), Miami (New World Symphony), Barcelona (MACBA) and Prague. 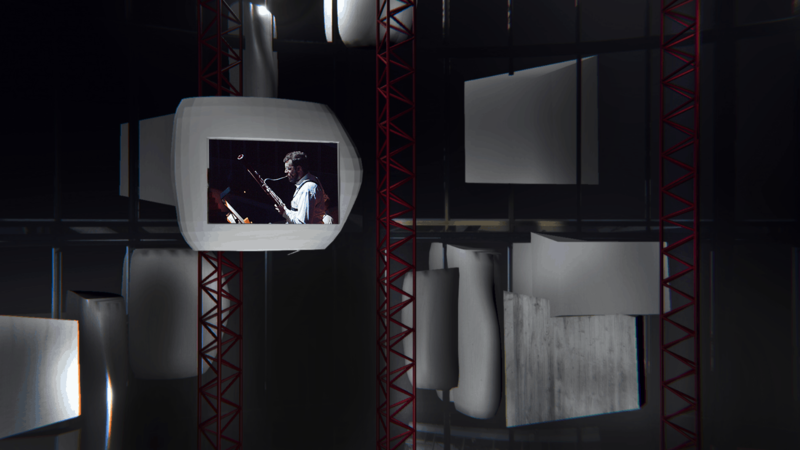 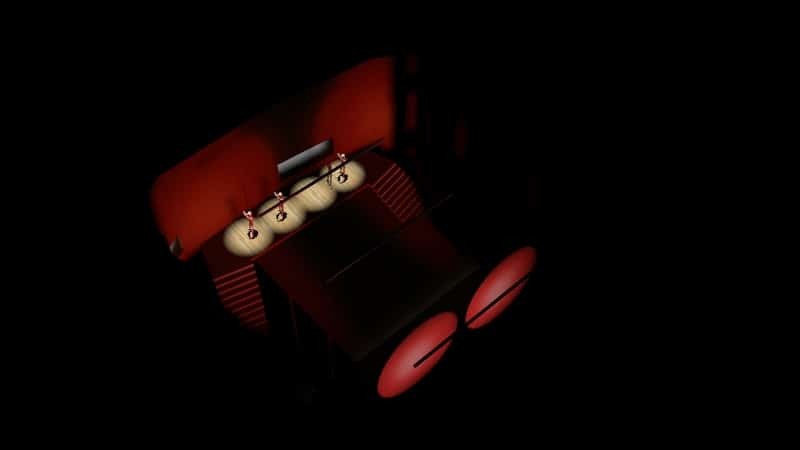 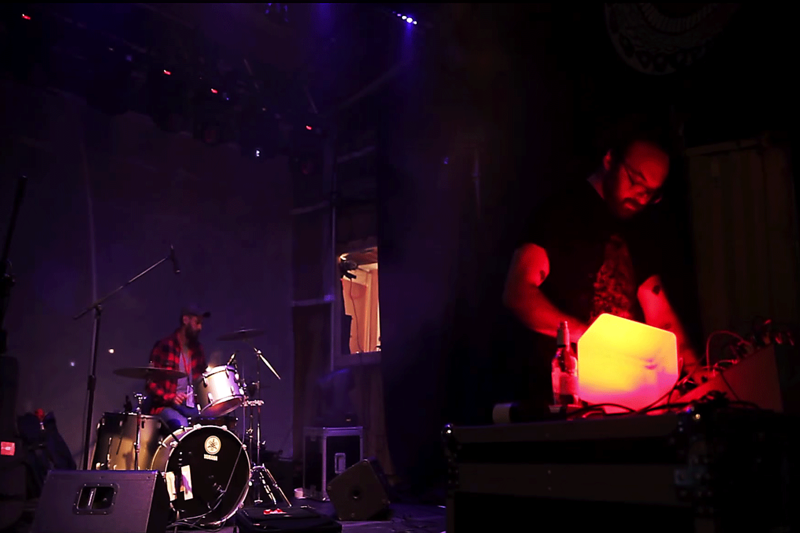 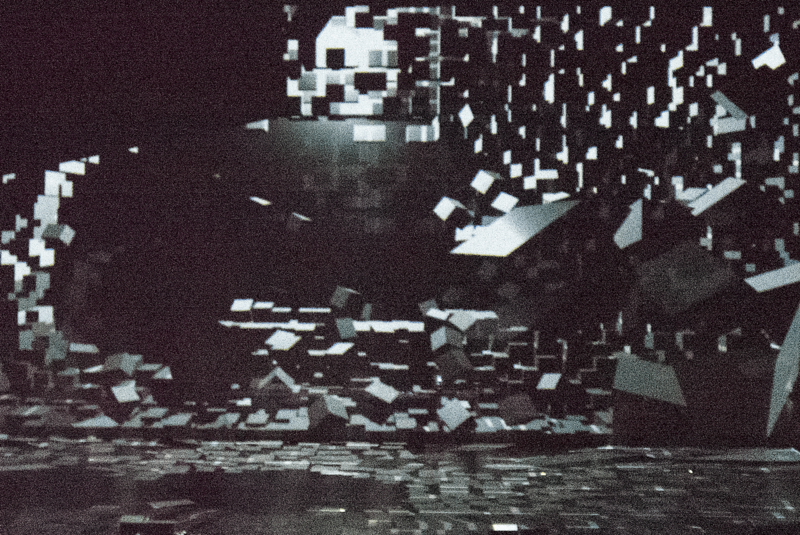 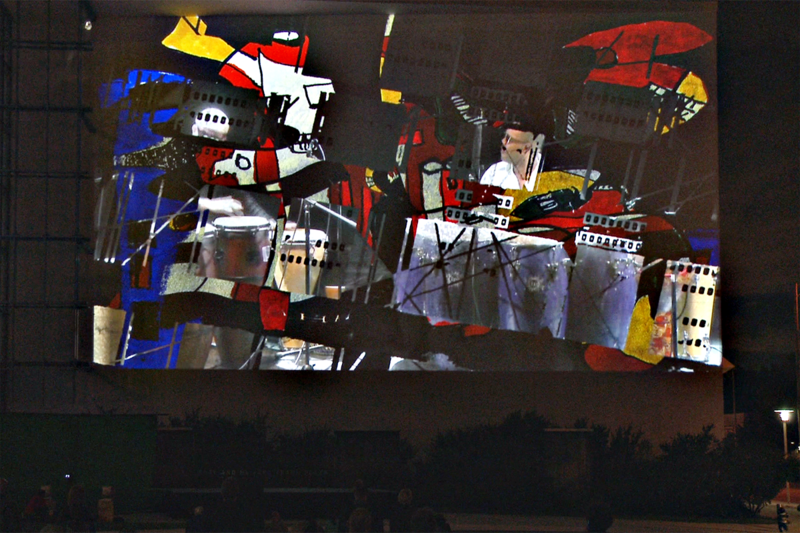 The project was conceived as a real-time film: low latency av streams from each of the four locations were sent to a live mixing station in Copenhagen where the streams were composed and transitioned in real-time, then fed to an adjacent studio where the audience were seated in front of a large projection screen. 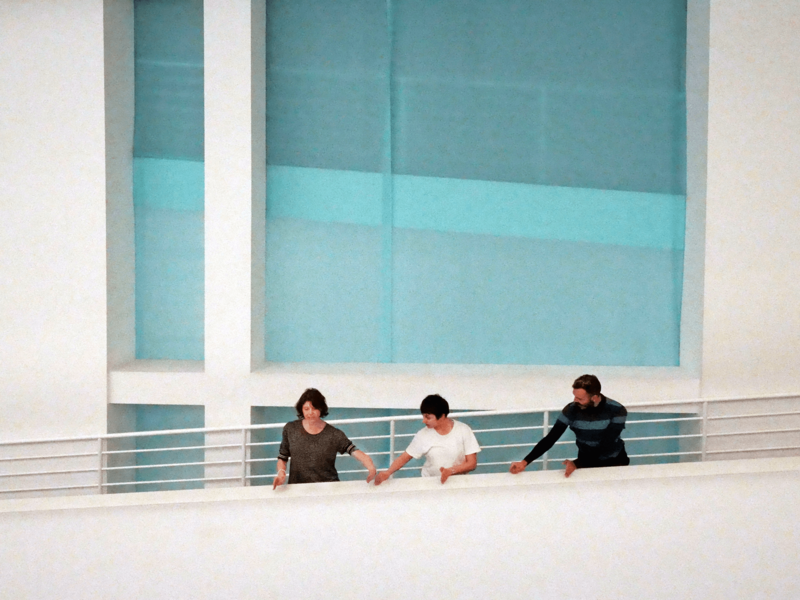 The performers in Copenhagen (on the roof garden of the Royal Danish Academy of Music), Barcelona (in a building adjacent to and overlooking MACBA) and Miami (on the roof of the New World Symphony in Miami Beach with views to the ocean) each explored – to a loose choreography – the similarities of their environments. 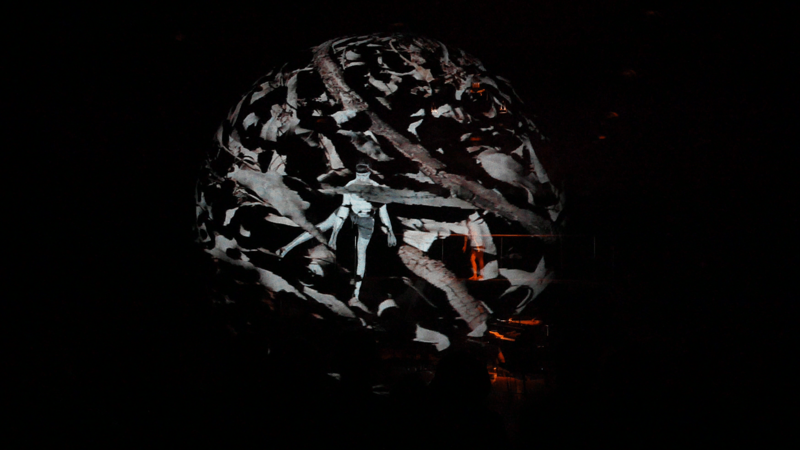 In Prague (at the National Technical Library) the group The Unlimited Trio provided the live soundtrack which was streamed to the other three locations for each performer’s movement. 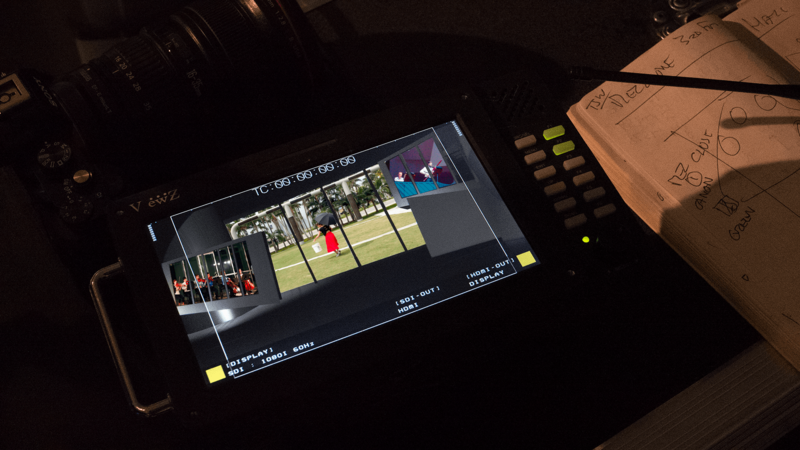 The project was supported by CESNET (the Czech academic network operator) who provided the live stream network hub in Prague and from there transmitted four HD1080 streams to Copenhagen for live editing. 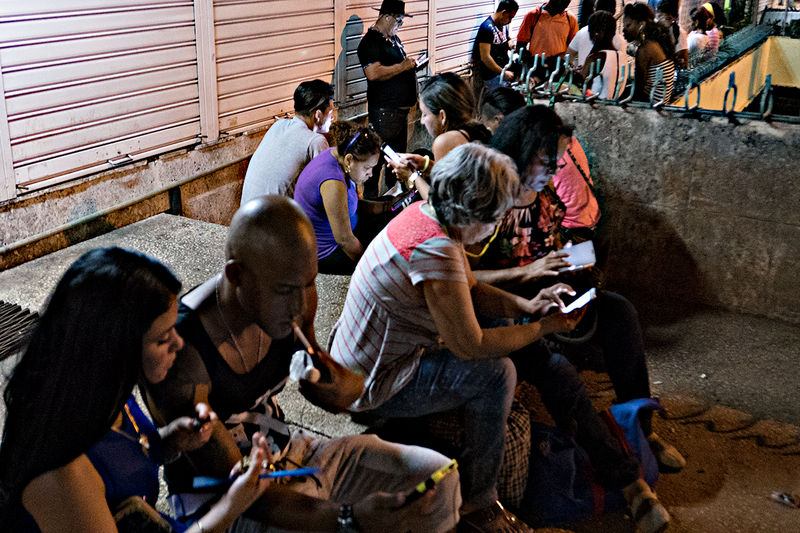 The Bridge To Everywhere:234 – World’s first network performance with Cuba! 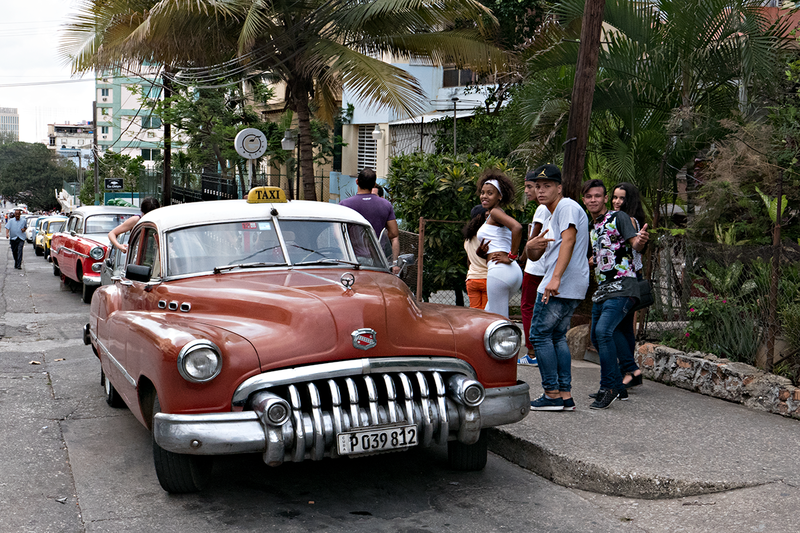 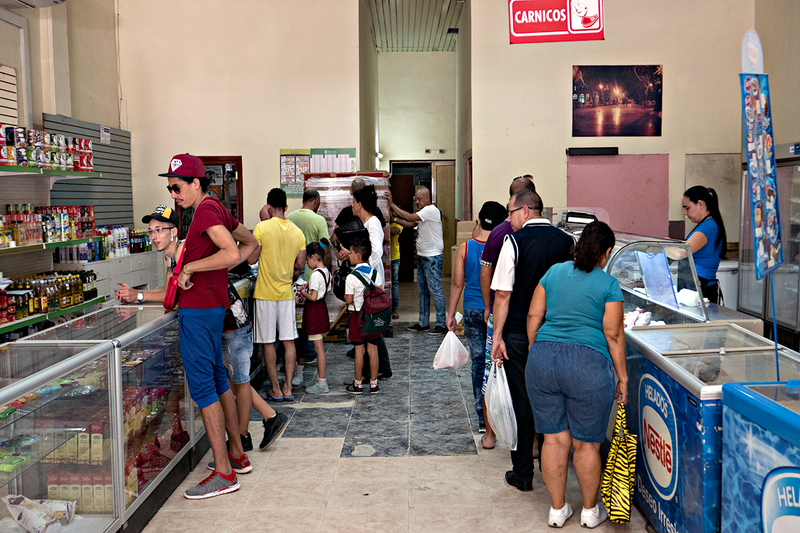 Between Havana, Cuba and Miami. 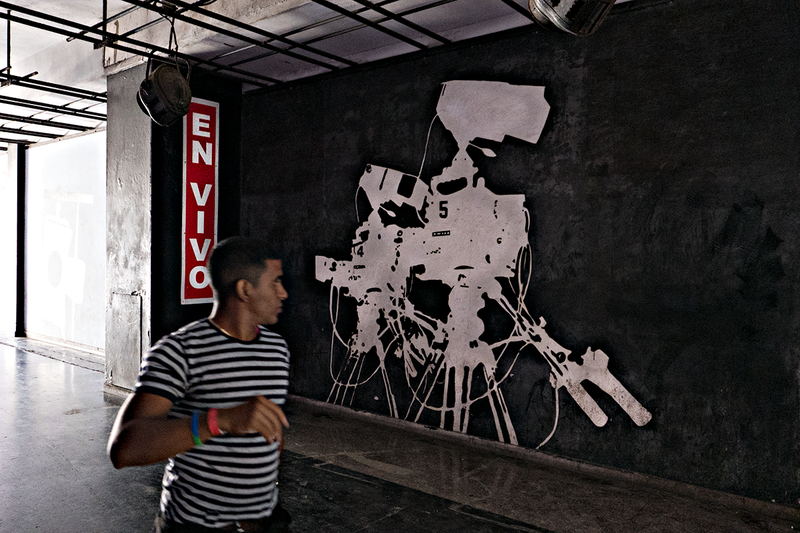 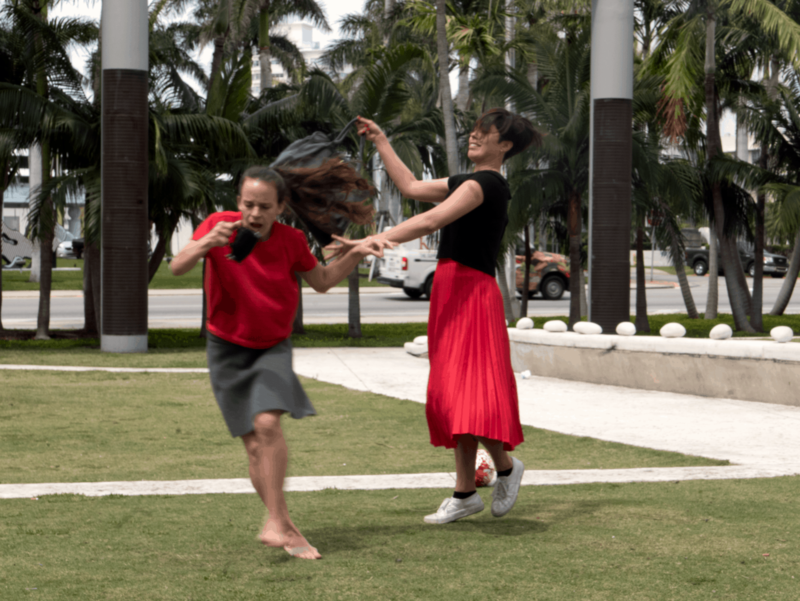 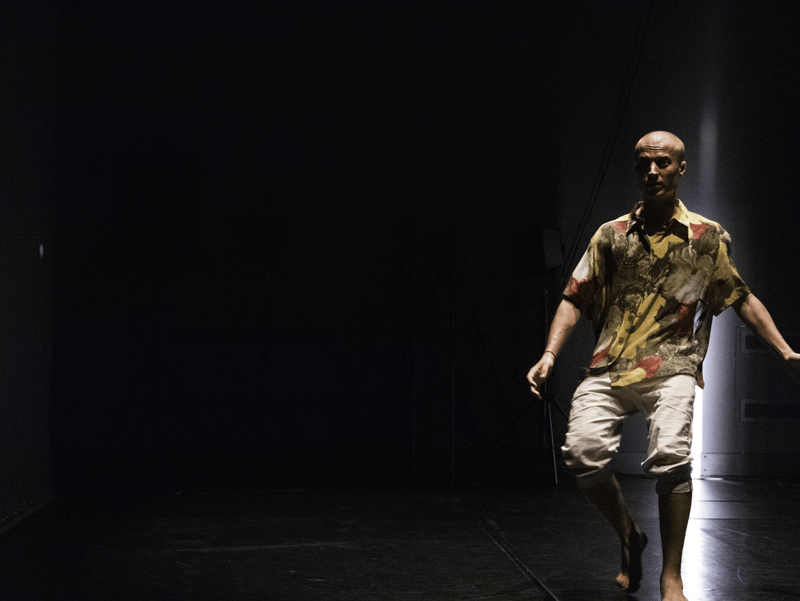 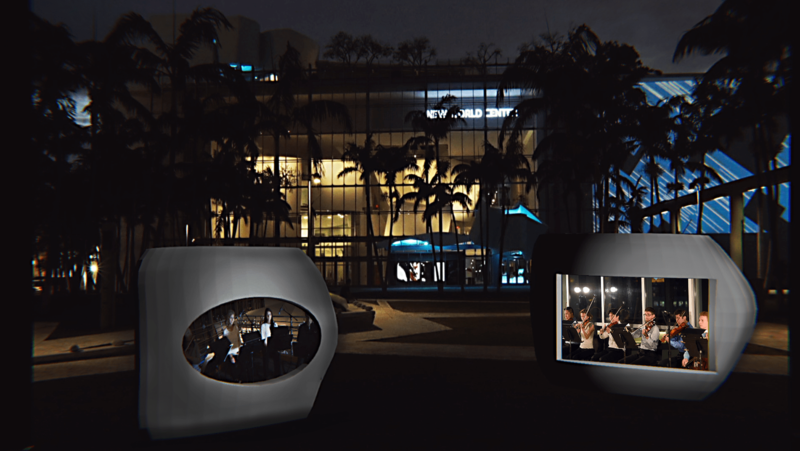 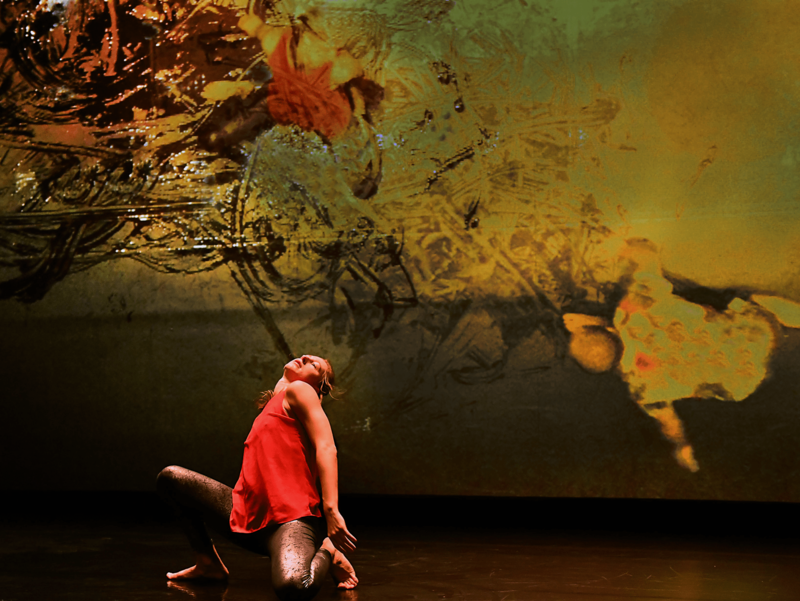 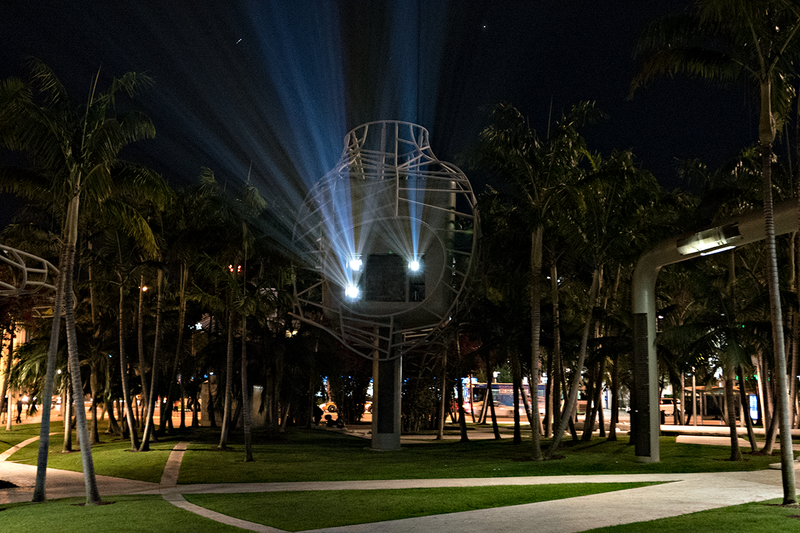 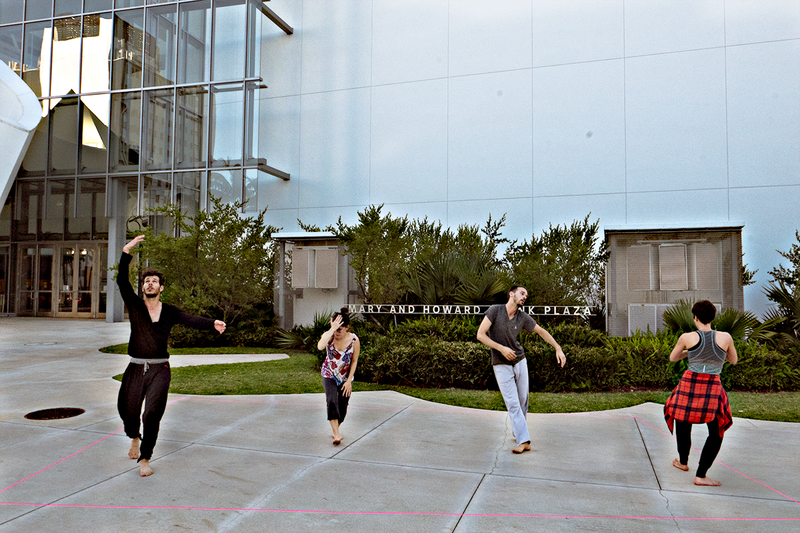 Cuban dancers and musicians performed live across three networked locations: at the New World Center of the New World Symphony in Miami Beach; at the LightBox of Miami Light Project in the Wynwood District of Miami; and in Havana, Cuba. 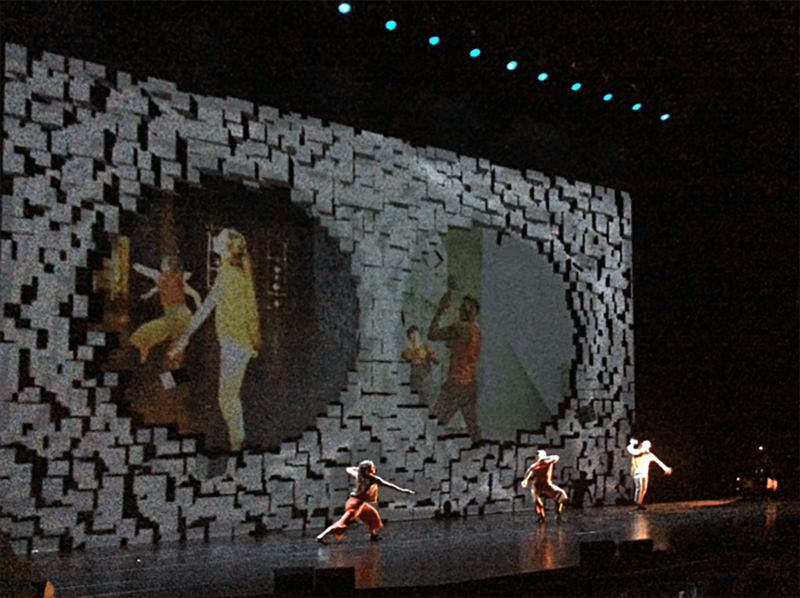 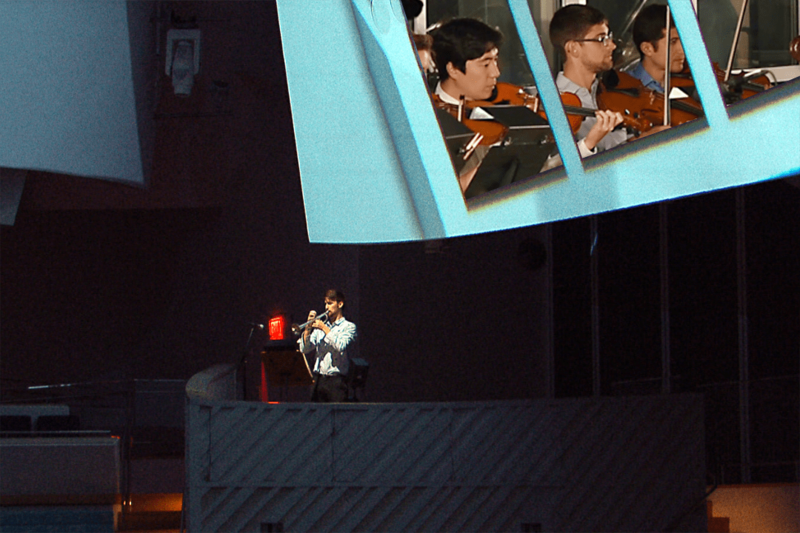 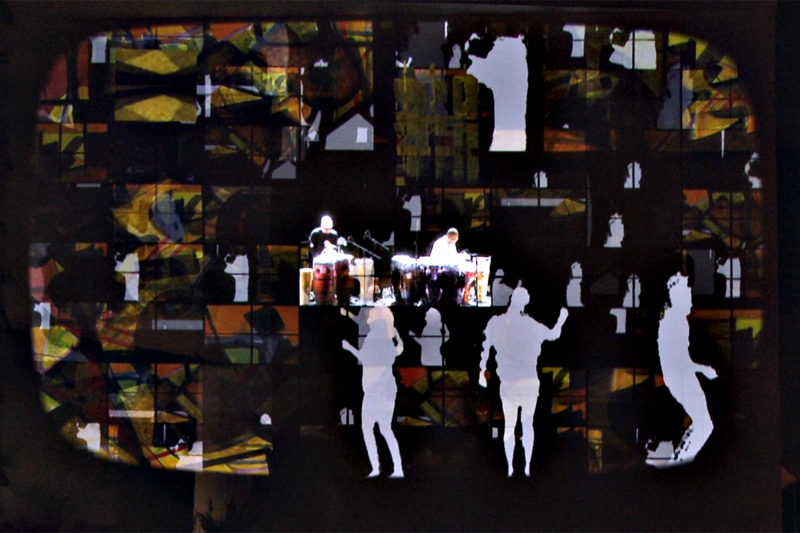 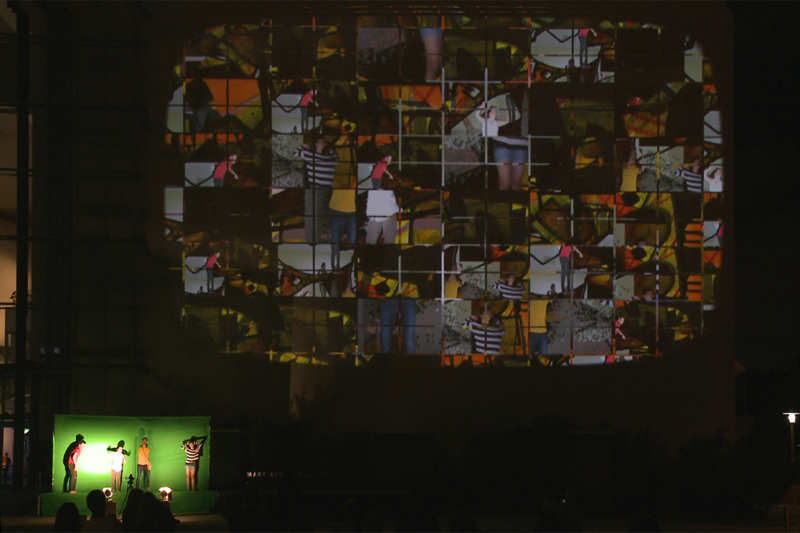 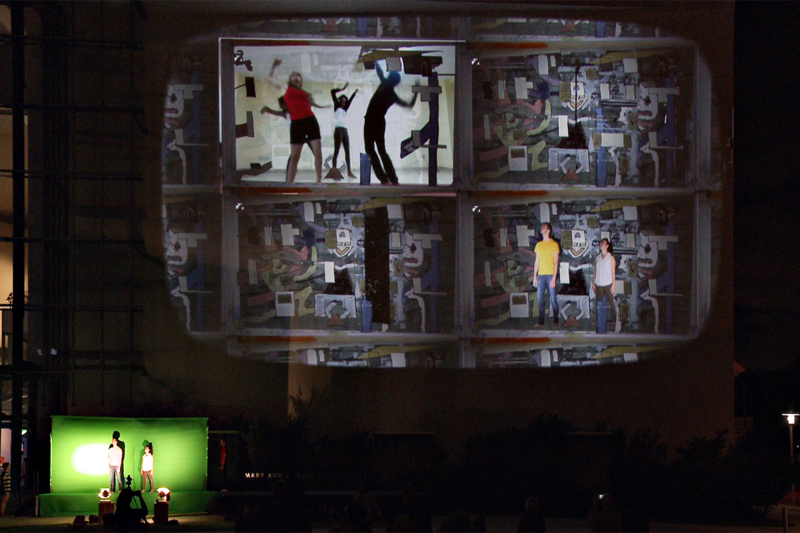 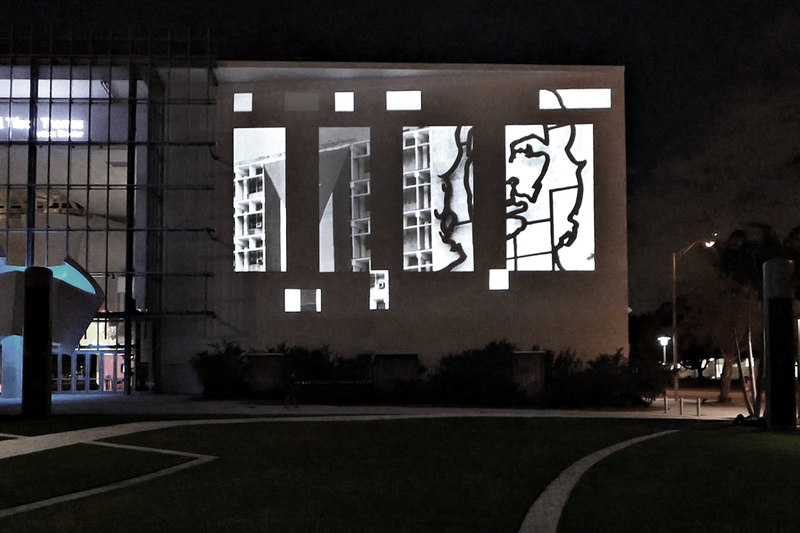 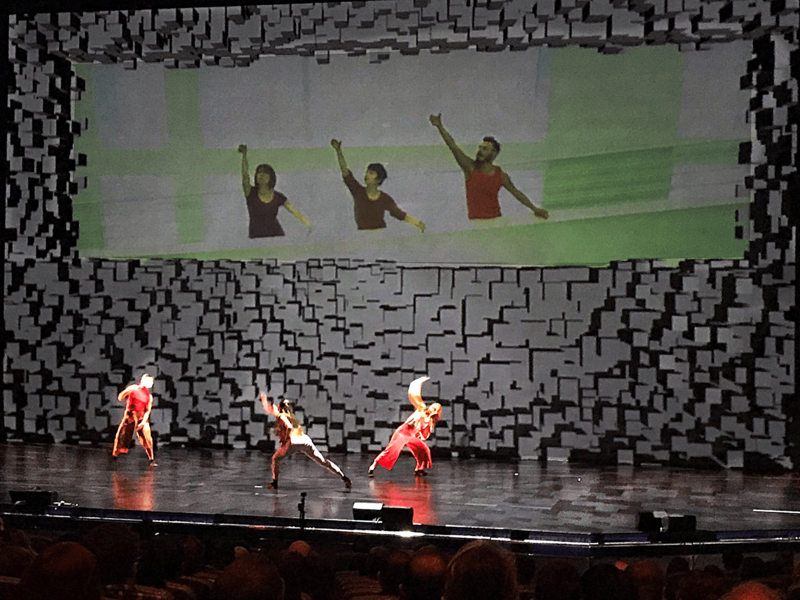 Edited highlights of the part of the performance at New World Center on 22 March 2016 on the 7,000 square foot (5 storeys high) Wallcast projection screen and live green screen stage. 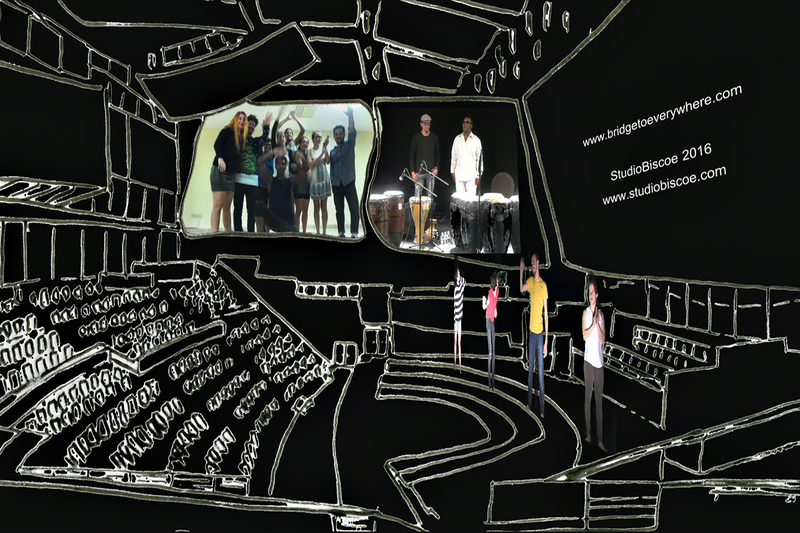 See further information on the project website, here and here. 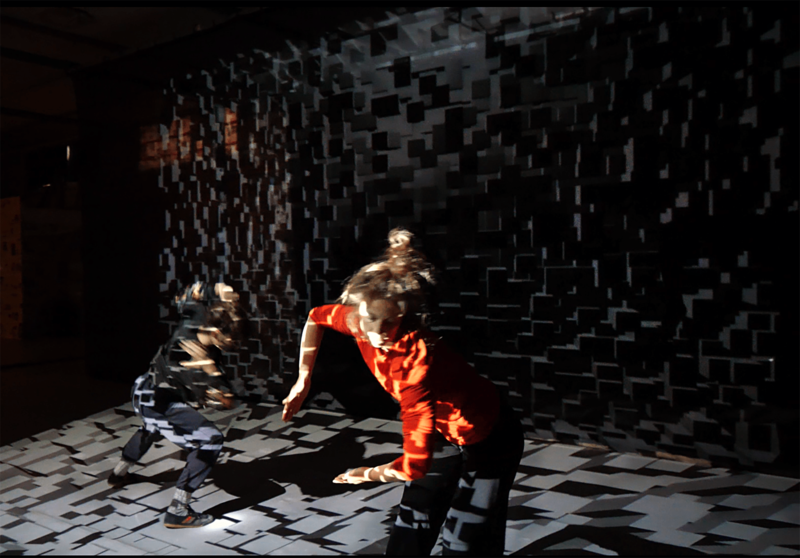 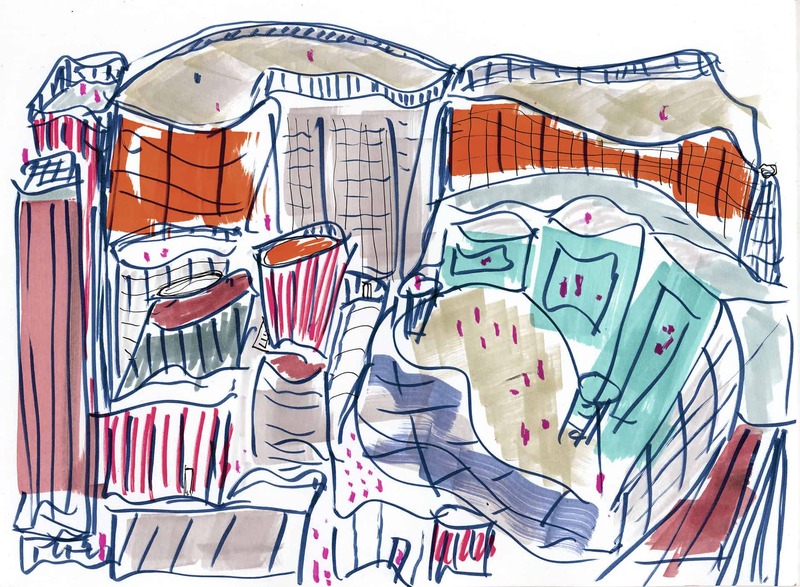 An exploration of three remotely connected sites, explored through the medium of dance and found sounds rooted in their locality, which asks the question what is here, what is not here, and if not here, where ? 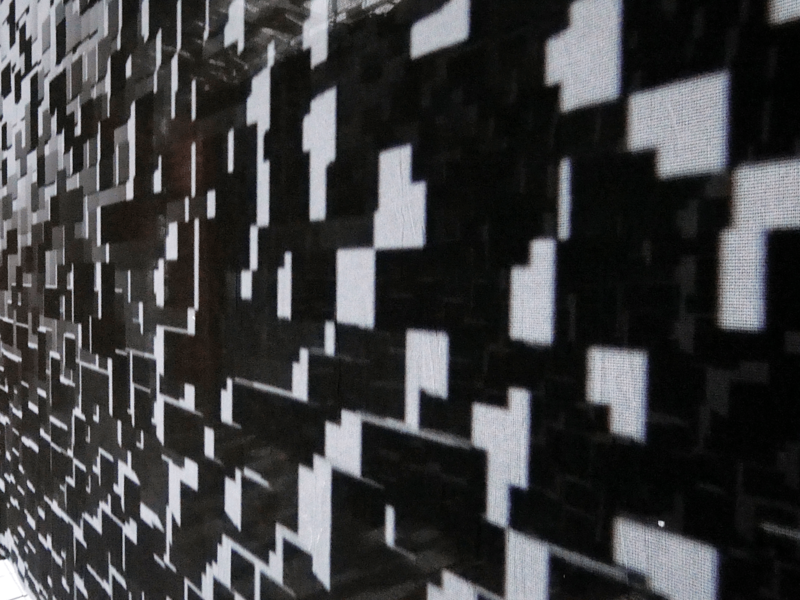 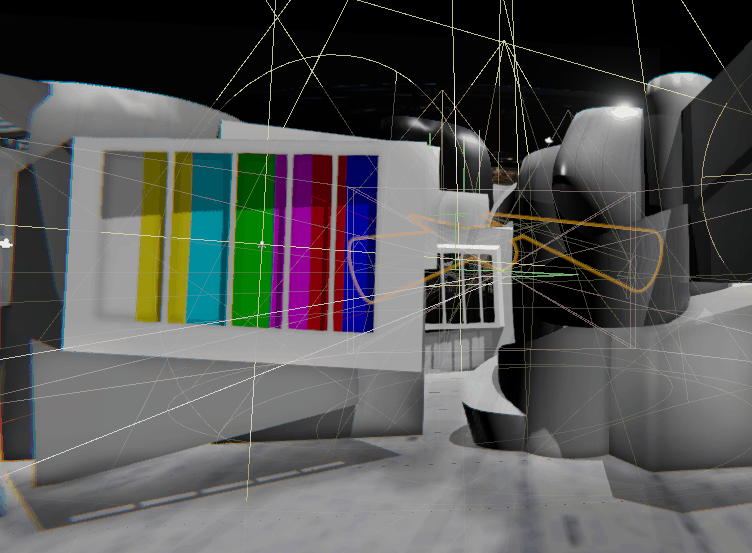 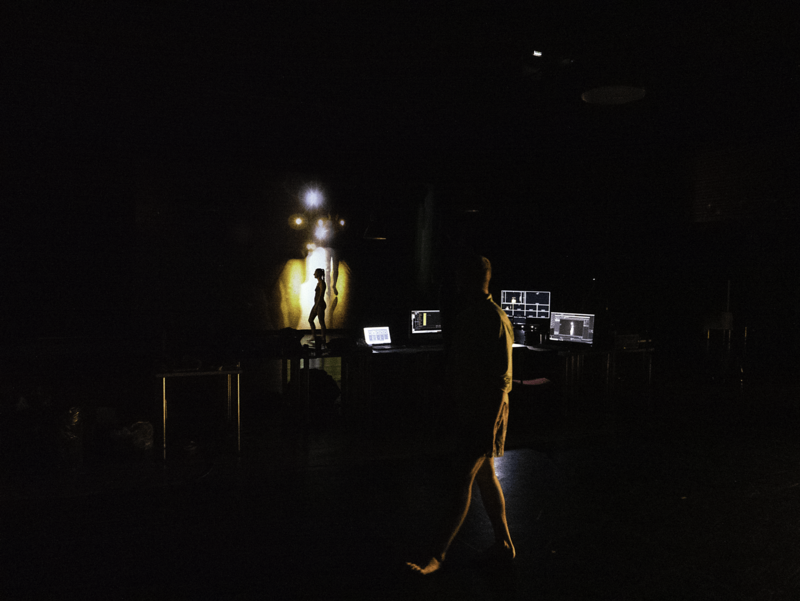 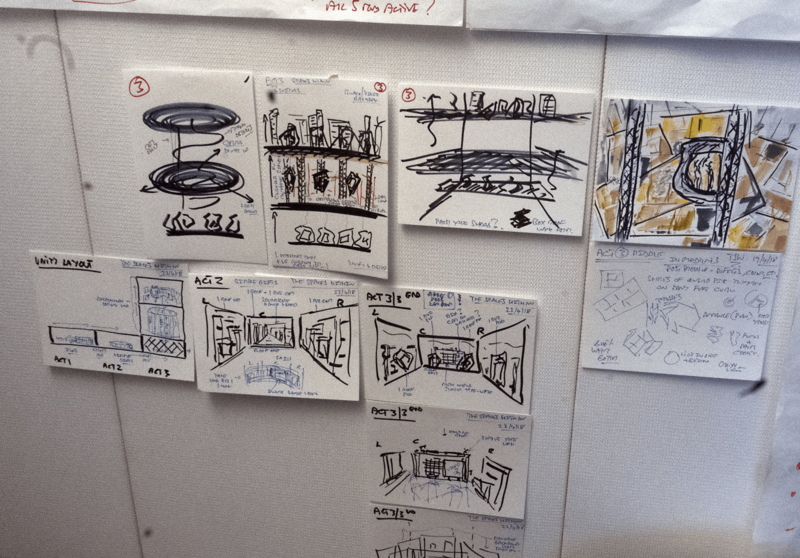 In this new work Studio Biscoe continues an exploration of new narratives for network performance: employing (primarily) open source streaming and projection mapping technologies; stepping away from fixed screen based visualisation; and endeavouring to investigate and reveal site specificity in a telepresence context. 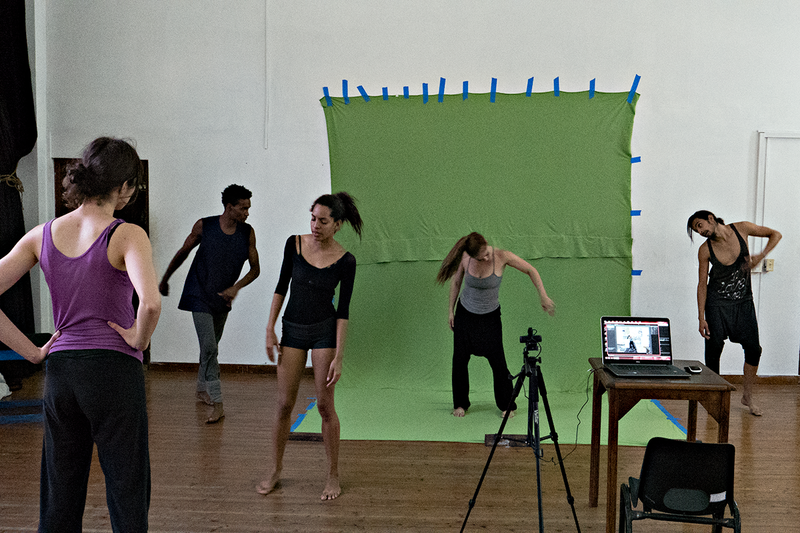 Thanks for the amazing support of the following: Choreography/Dancer – Margherita Bergamo; Dancers – Ina and Tiia Veneranta Falmouth; Technical Operations – Dan Thompson and Josh Butcher, Joint Effort Studios; Manchester Technical Operations: Jason Crouch; Floating Surface Fabrication – Dom Allen (DAW Electronics); Sound Recordings – David Prior; Venues: Falmouth University & Contact Theatre, Manchester. 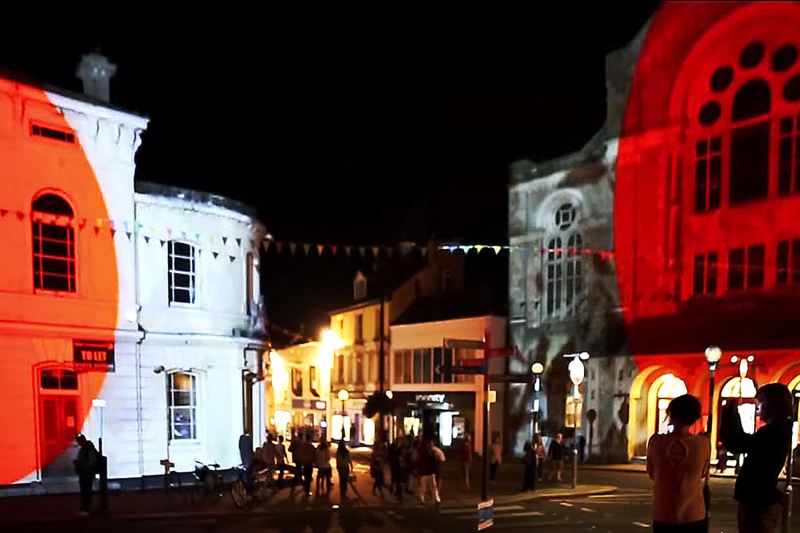 This project was partly supported with funding from JaNet/Jisc. 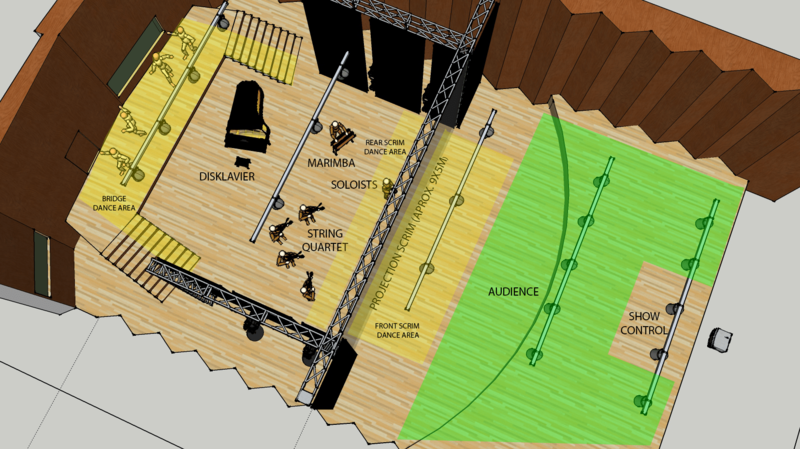 The Online Orchestra is a research project funded by the Arts and Humanities Research Council (AHRC), investigating how the internet could be employed to give children and amateur musicians who live in remote communities around the country the same opportunities to play in an orchestra as those who live in larger towns and cities. 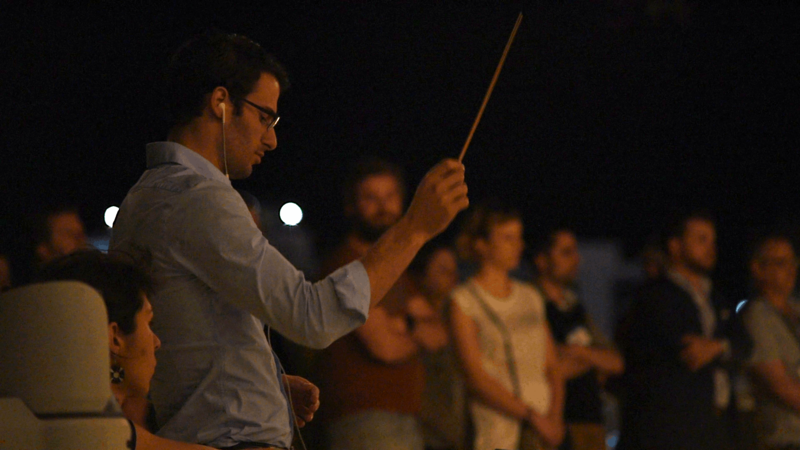 The premier performance on 12th July 2015 covered four locations: Truro Cathedral (Strings, Choir, Percussion), Mullion School (Brass) , Five Islands School on the the Isles of Scilly (Flutes) and the conductor John Hargreaves at Falmouth University. 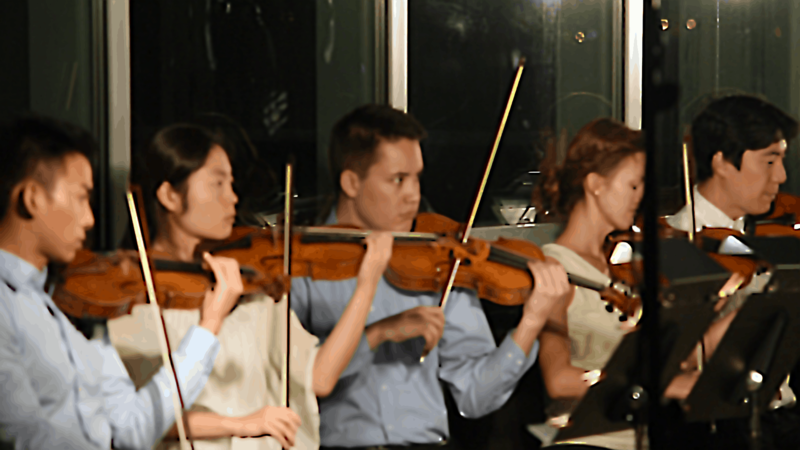 The event was attended by more than 400 people and worked flawlessly. 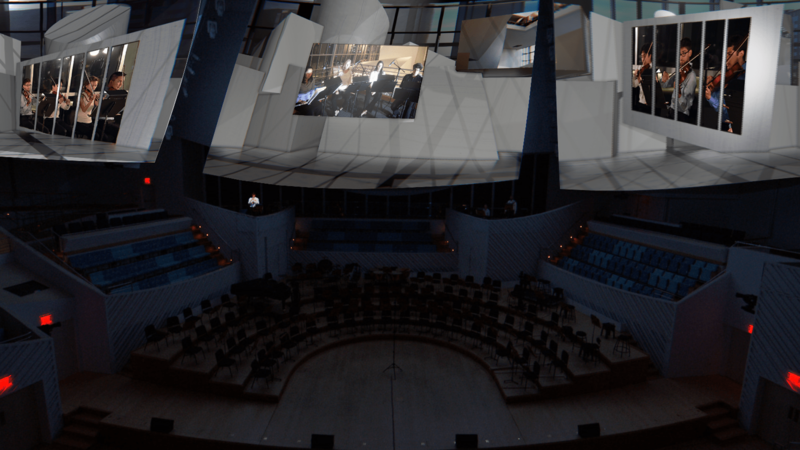 Studio Biscoe supported many areas of the research project,providing expertise in network latency and real time performance, audio/video streaming and the project website. 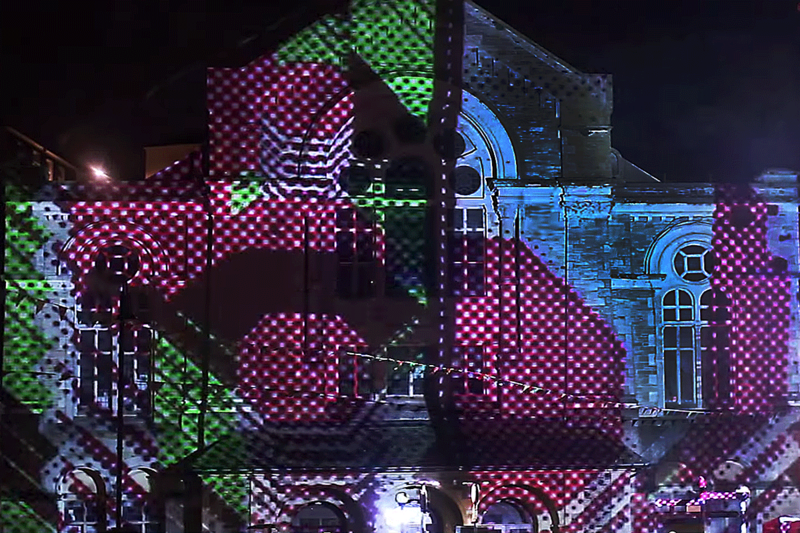 For the premier performance at Truro Cathedral Studio Biscoe designed the video streaming platform, projection mapped installation onto 3 large screens, and custom graphics/animations. 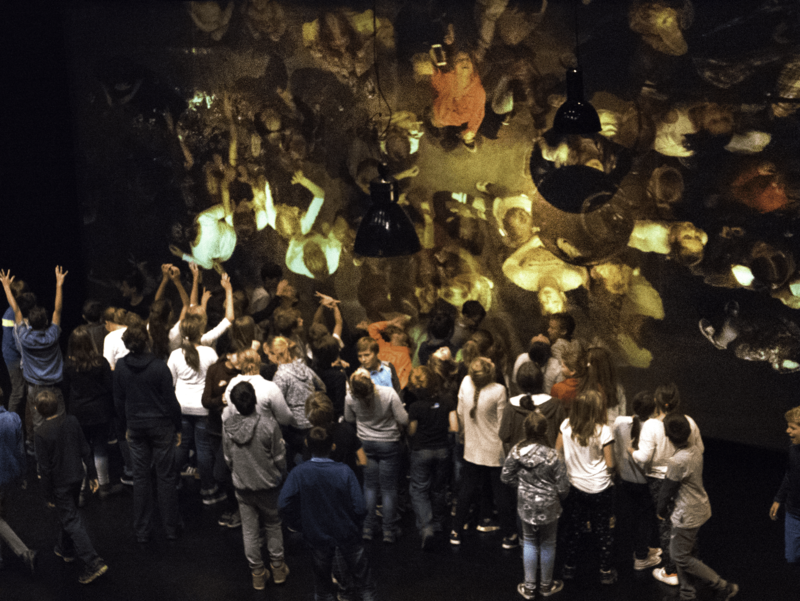 The Online Orchestra won gold in the arts and humanities category of the 2017 Reimagine Education awards and a silver award in the European competition (cross-discipline): . 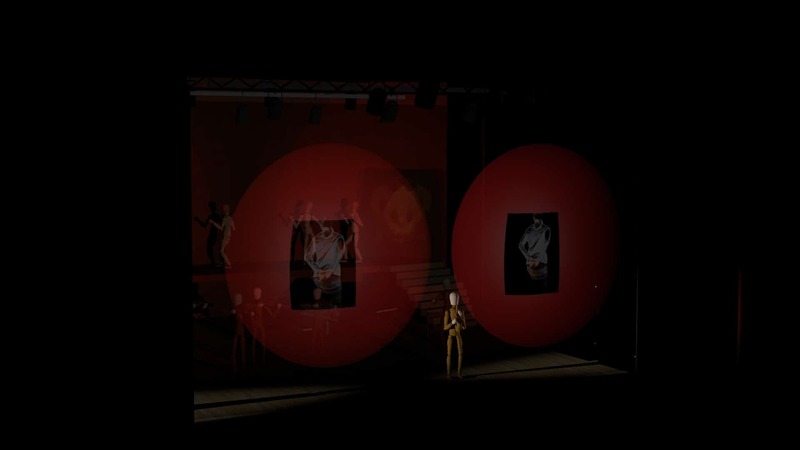 A meeting with Catalan artist Marcel·lí Antúnez Roca at a conference in Barcelona a few months before led to a cooperation in which two performance spaces (Falmouth University in Cornwall, UK and Arts Santa Monica in Barcelona) were linked for a unique interactive telepresence theatre event on 9th April 2015. 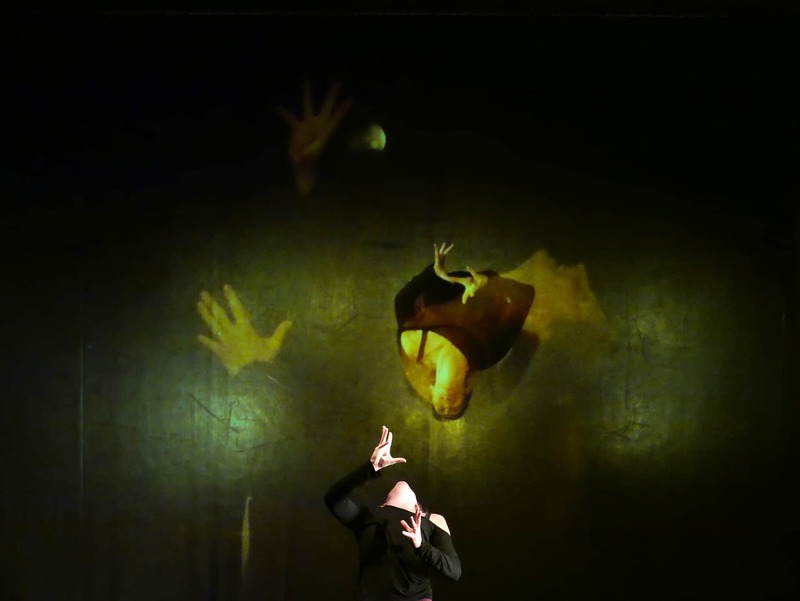 Ultraorbism was a project directed by Marcel·lí Antúnez Roca, based on True Histories by Lucian of Samosata. 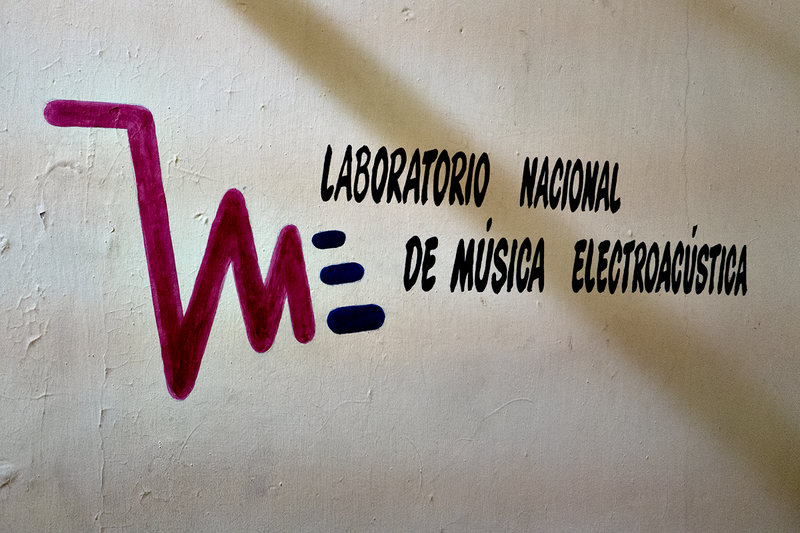 It was part of the European project SPECIFI and the research area RICHES. 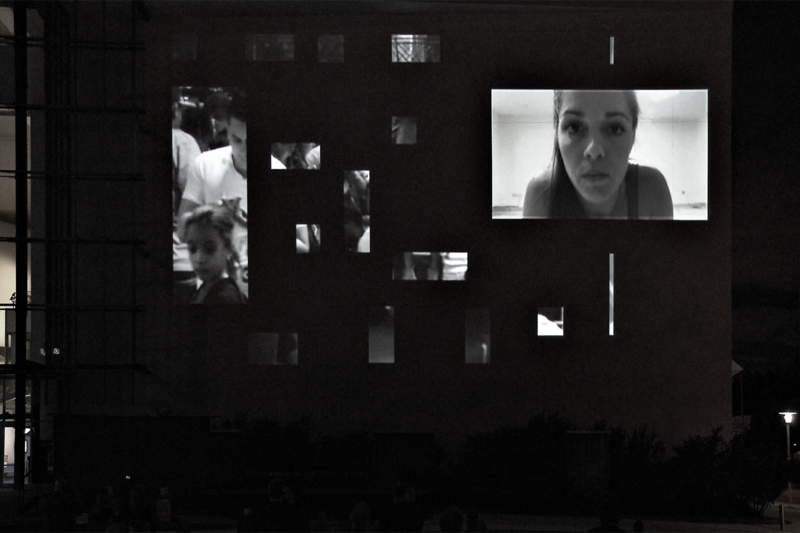 Support was from the Ministry of Culture of the Government of Catalonia and the i2CAT Foundation. 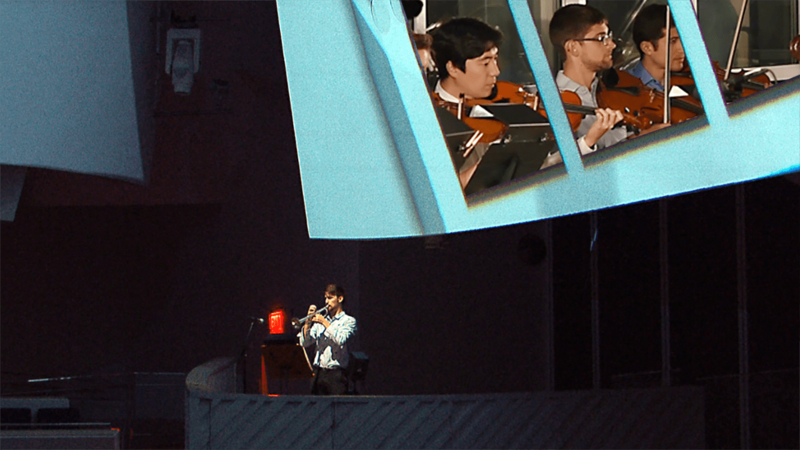 A four location streamed audio/video performance with disklavier (automatic pianos), chamber orchestra and pianist. 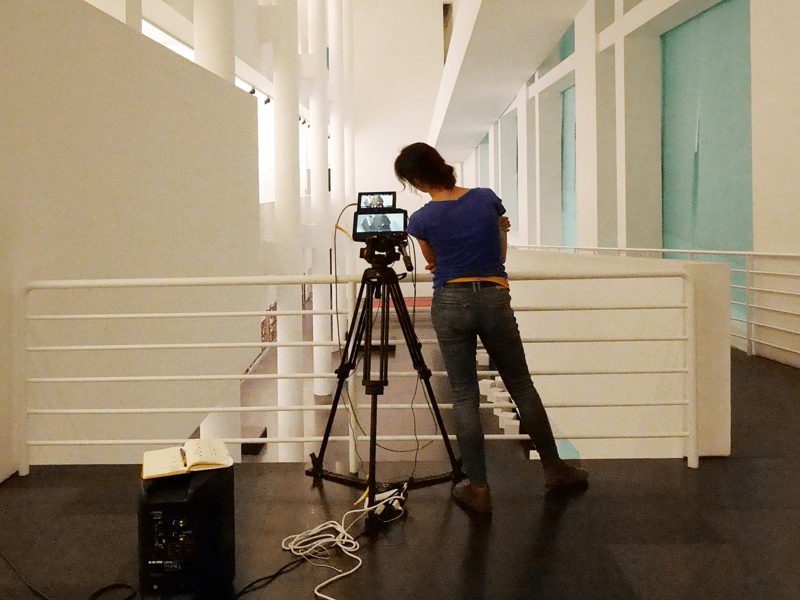 In conjunction with the Vconect platform and research project Studio Biscoe developed custom audio/video streaming platforms and supported many aspects of systems integration and production. 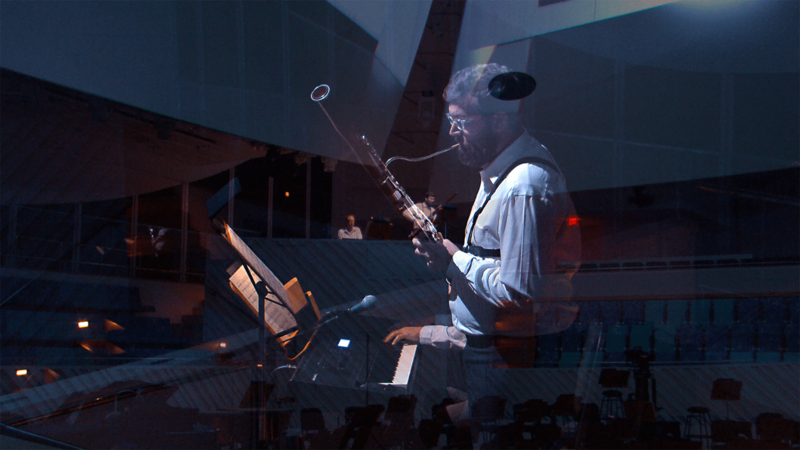 Music composed by Jim Aitchison in response to the works of Gerhard Richter. 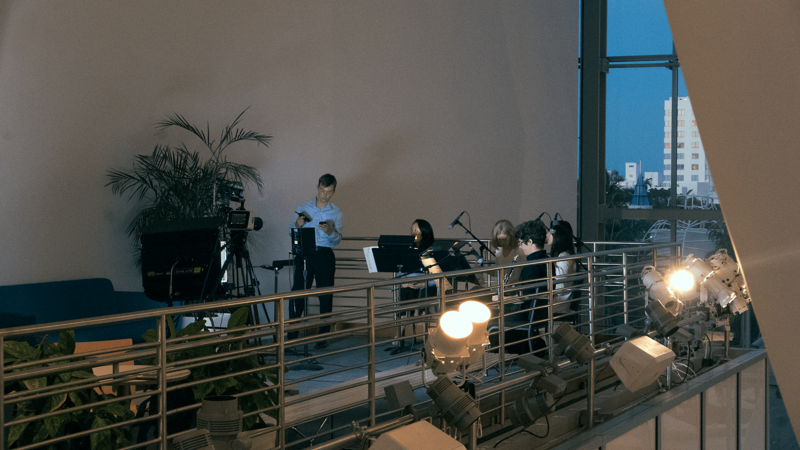 In part one of the performance, Pianist Roderick Chadwick played 4 Disklavier pianos simultaneously, linked via broadband, 300 miles apart, at Falmouth University, The Royal Academy Of Music, Goldsmiths University and Yamaha Music London. 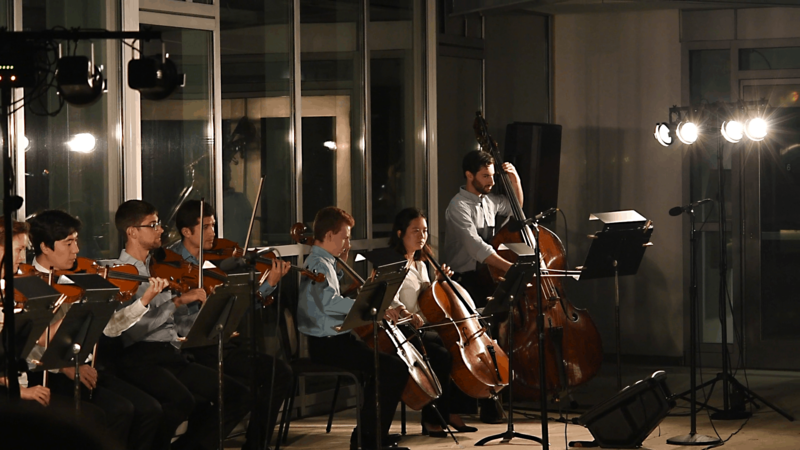 In part two, the music was performed once again, in a re-filtered version for string quartet, by the Kreutzer Quartet (Peter Sheppard Skærved, Mihailo Trandafilovski, Morgan Goff, and Neil Heyde). 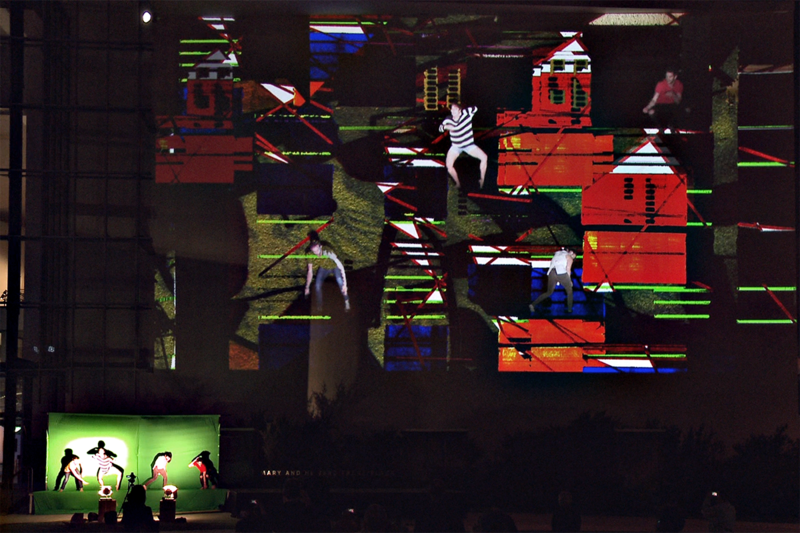 An innovative performance in Cornwall of Shakespeare’s 400-year-old play The Tempest – modified for two stages at networked locations – explored how technology can change the way we experience theatre; examining new narratives (or an expanded classic in this case) and bringing remote audiences together in a unified experience. 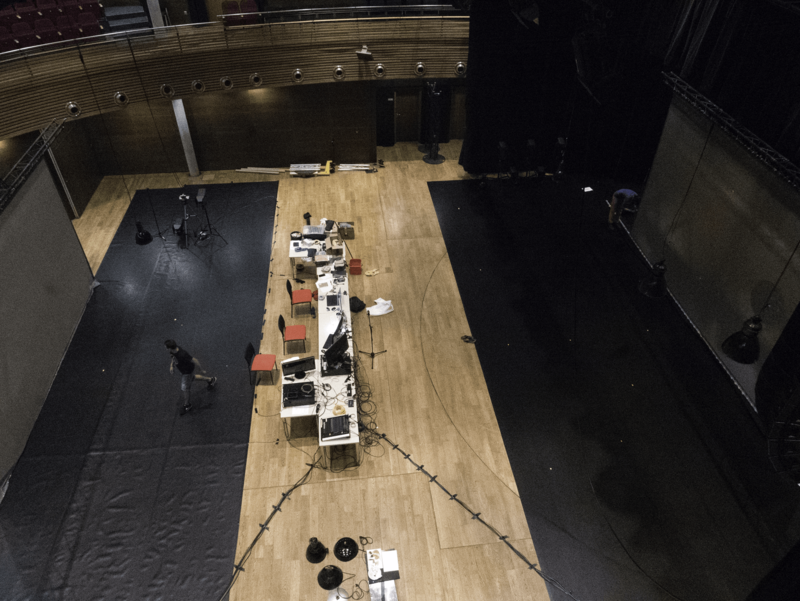 The project provided a use case examination of the Vconect conferencing platform with script, staging and actors provided by Cornish based Miracle Theatre. 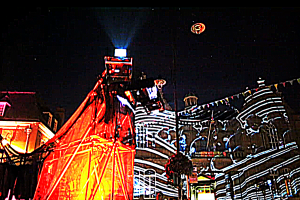 Unmanned cameras (with pan tilt zoom functions controlled by a computer based script engine) at each location captured the performance and streamed it live over the BT superfast connection to screens at the other location and to audiences at home, watching on the internet. 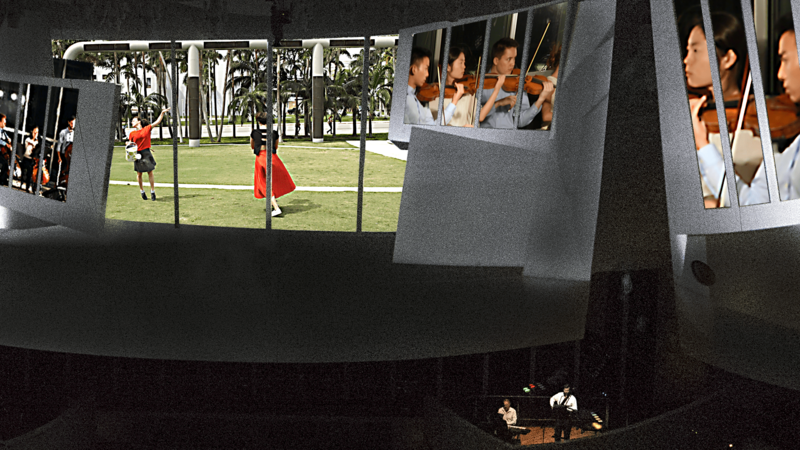 It is believed to be the first time in the world that a production performed at two locations in this way has also been transmitted over the internet to people at home. 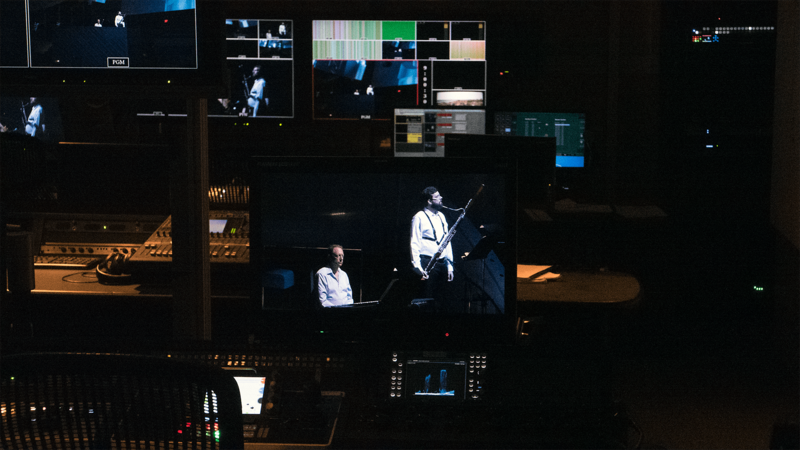 Studio Biscoe developed custom audio/video streaming platforms and supported many aspects of systems integration and production. 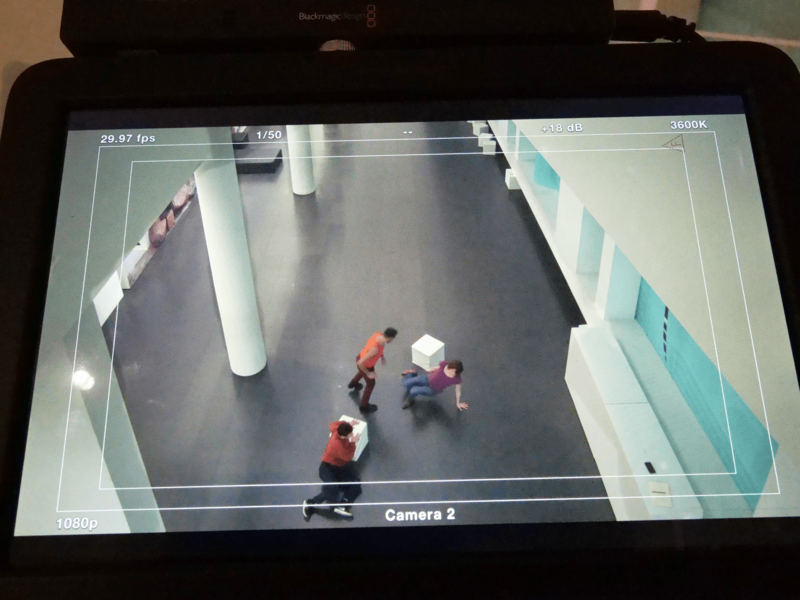 A demonstration of the Vconect smart video conferencing platform supporting an ambitious demonstration at ICT 2013 in Lithuania. 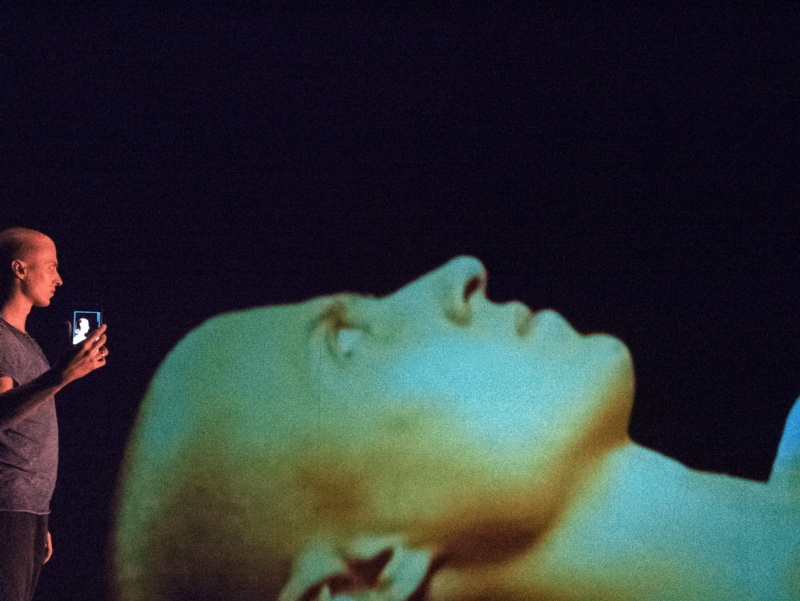 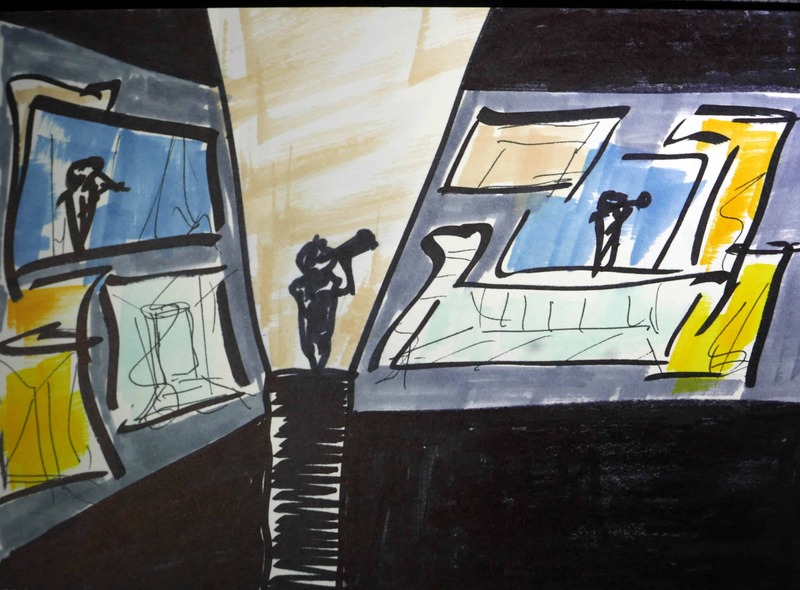 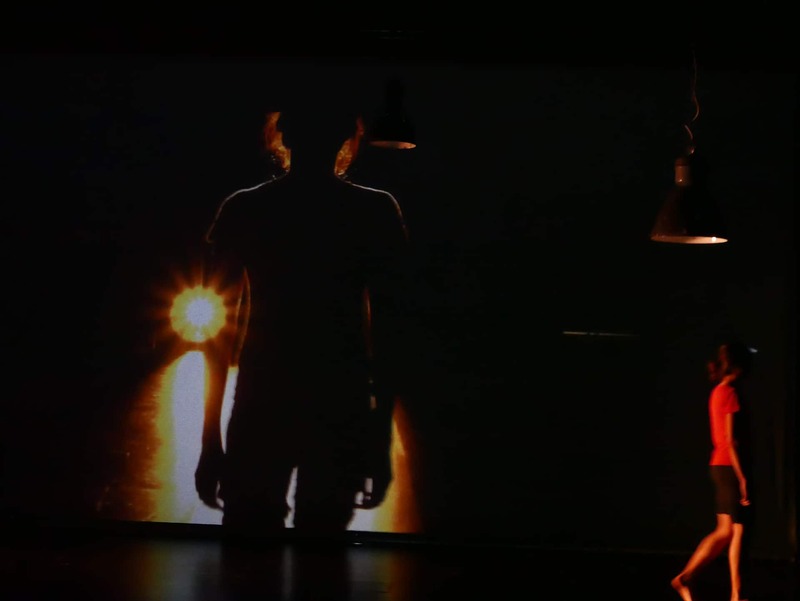 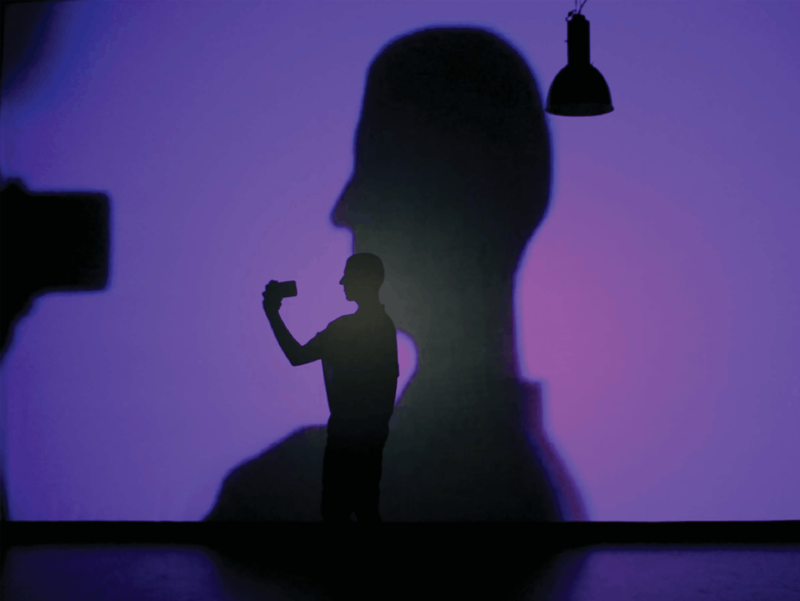 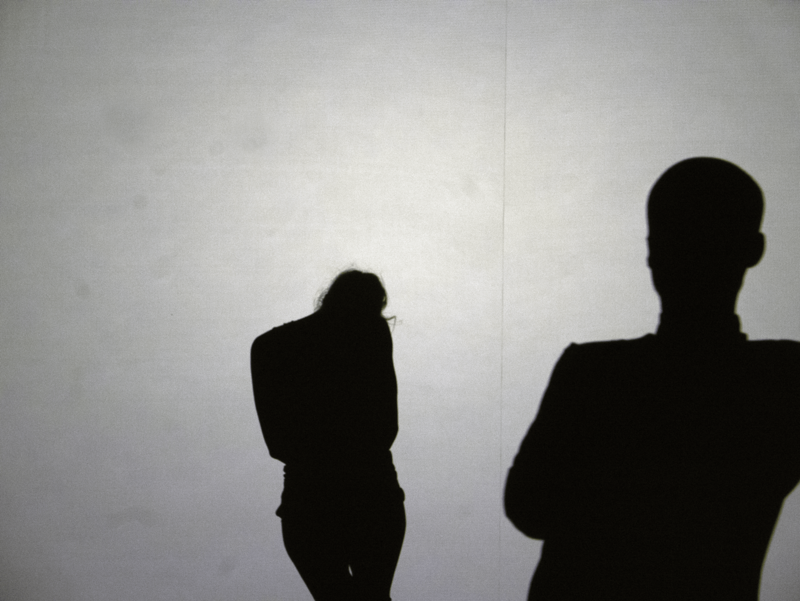 The Vconect platform enabled the delivery of scenes from Beckett’s play ‘Waiting for Godot’ performed by an actor in Vilnius and one in Falmouth. 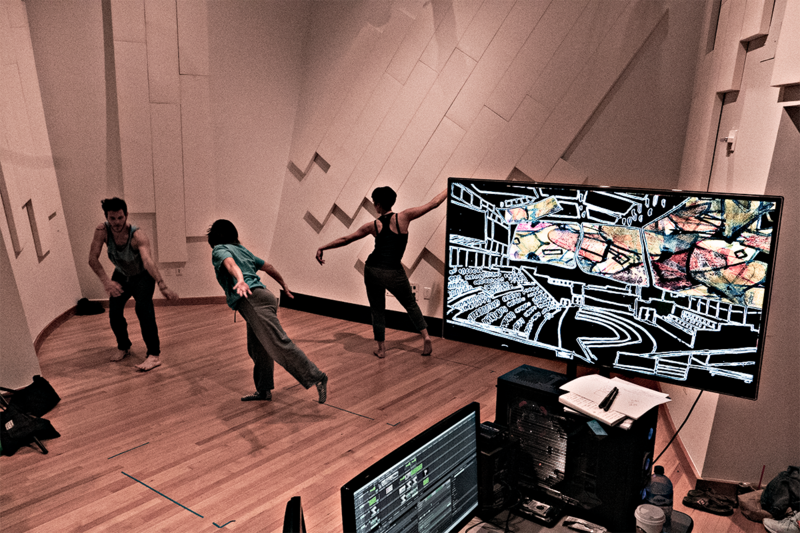 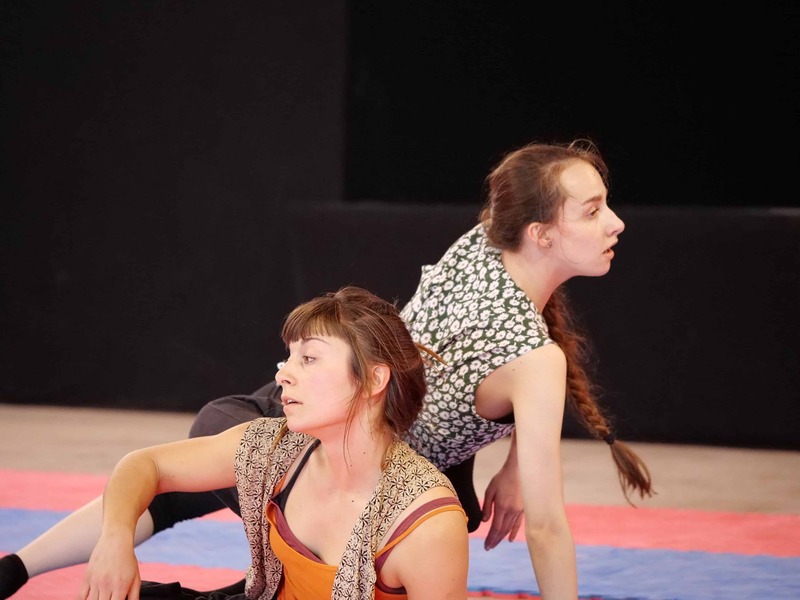 The demonstration helped highlight the way that concepts from Vconect can be used to support innovative styles of dramatic performance and acted as a first technical test of the system that will be used to support the performance of The Tempest in late summer 2014.